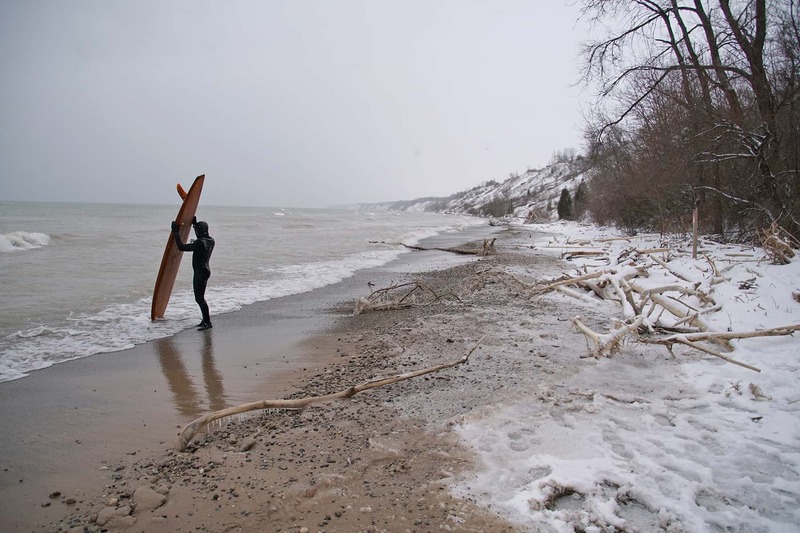 With Winter upon us and as the ice shelf builds, extending further out into Lake Michigan, for a time thoughts of walks along the beach, playing in the water or surfing seem as alien as the landscape that forms with each subzero day. 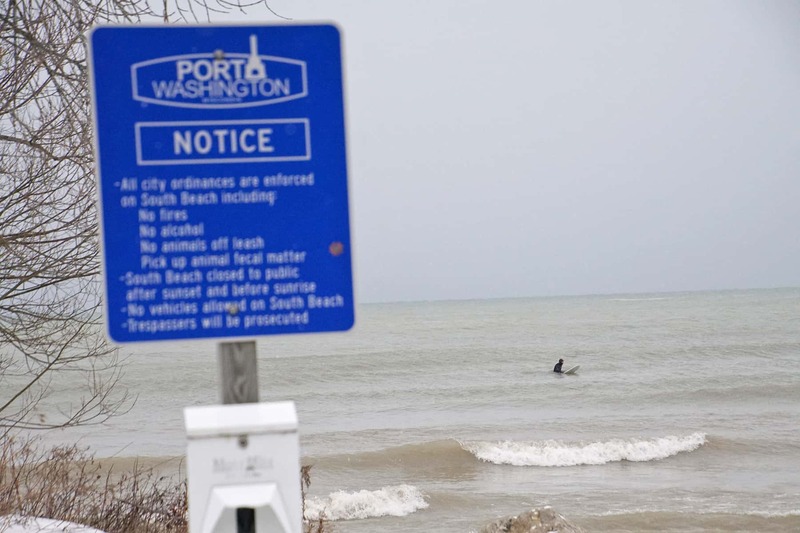 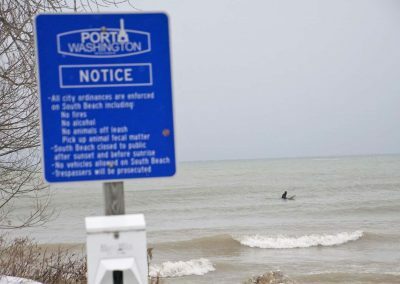 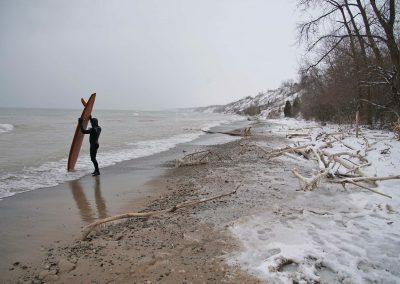 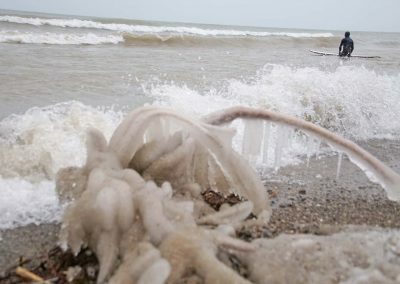 But in the eyes of hundreds of individuals across Lake Michigan they long for the day when the temperatures rise, ice melts and the waves crash once again. 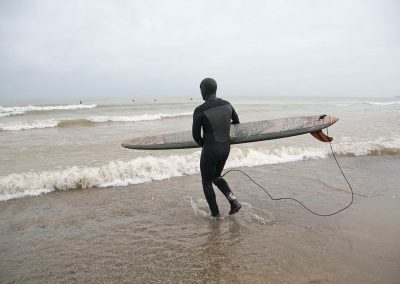 Those who surf put their boards up and the dialogue between them on dryland becomes merely relegated to texts or a familiar name tagged or clicking “like” on social media. 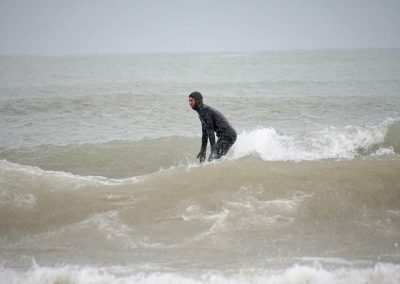 Nevertheless, the bonds remain as they each know that the waves will return. During the iced in days of Winter thoughts go to warmer places on warmer coasts and surfers longing for the thaw. 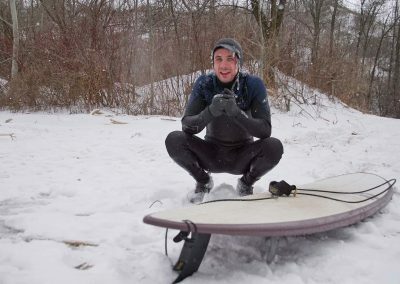 The thaw that brings the boards down from the rafters and puts them back on top of cars. 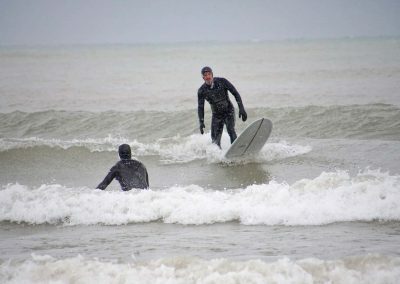 Soon parking lot conversations ensue as they watch the sets rolling in, smile and prepare to catch some freshwater waves. 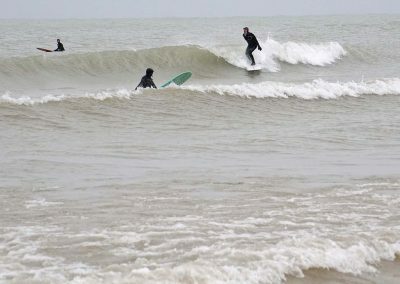 The bonds formed surfing at times are only enacted when they are immersed together in the water. 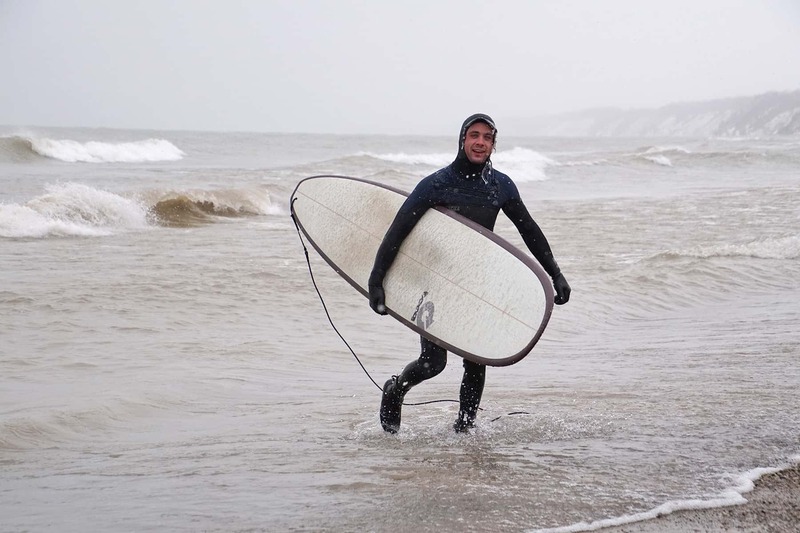 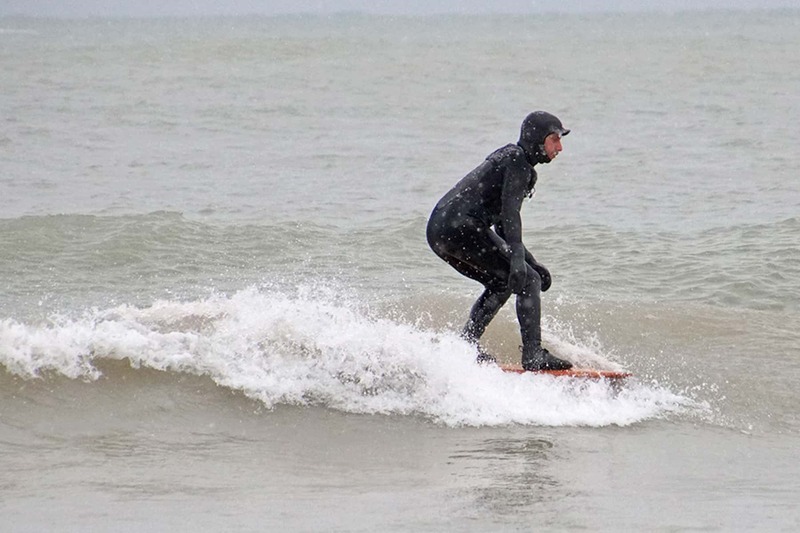 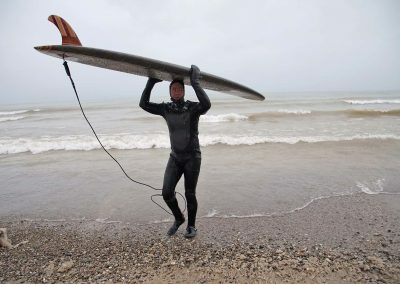 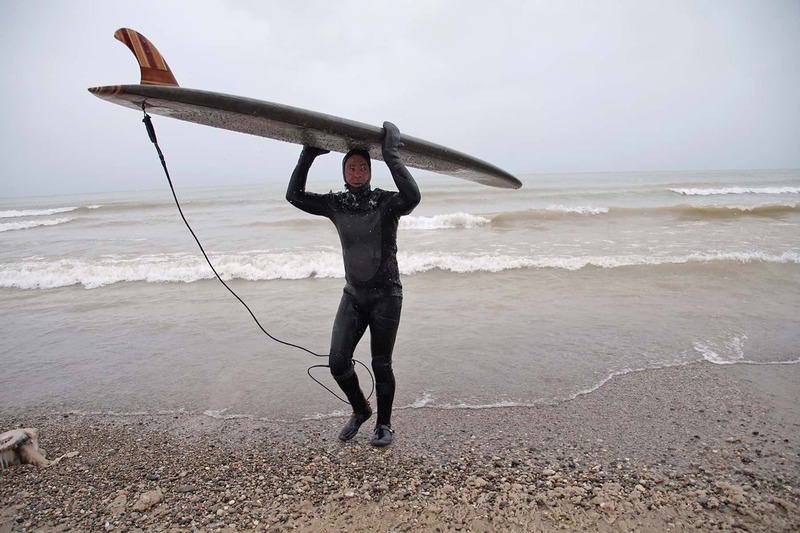 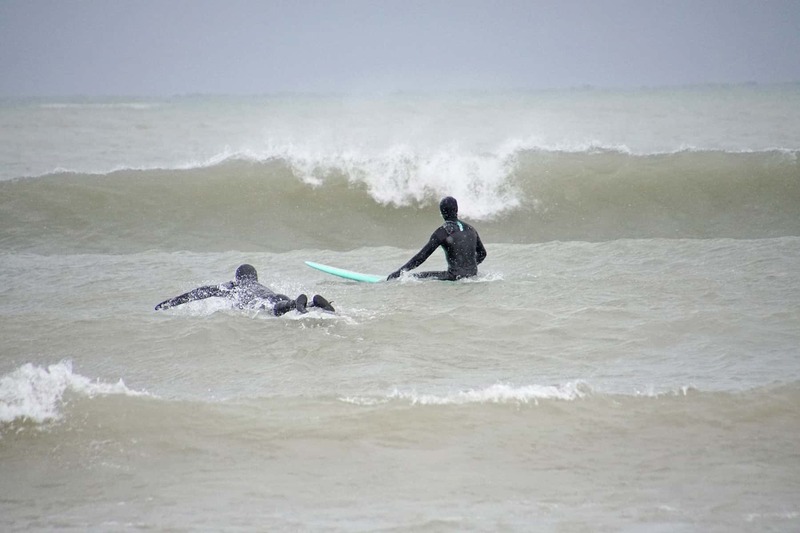 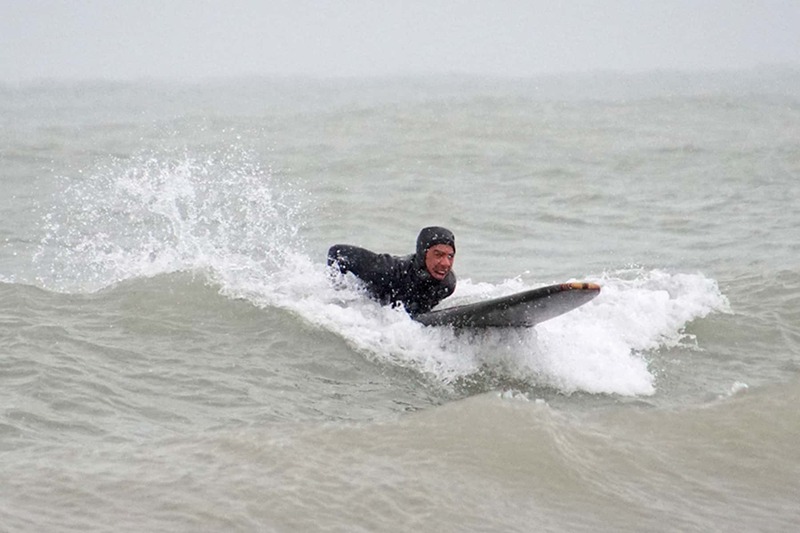 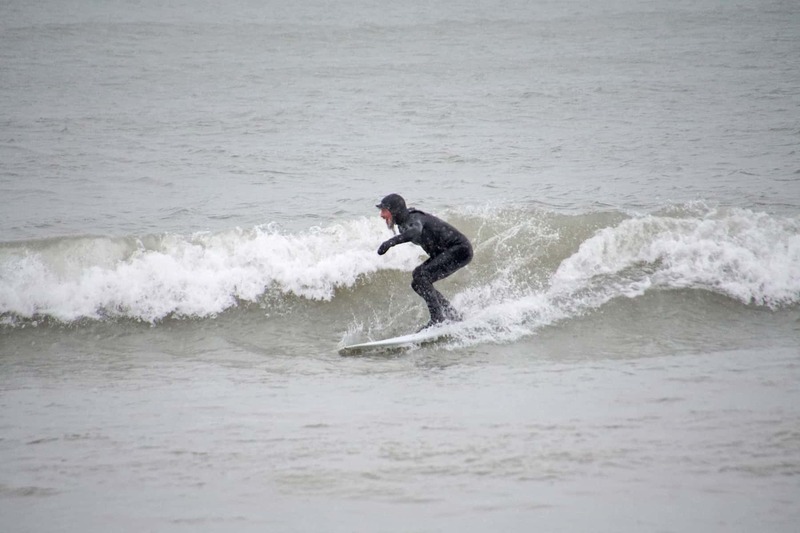 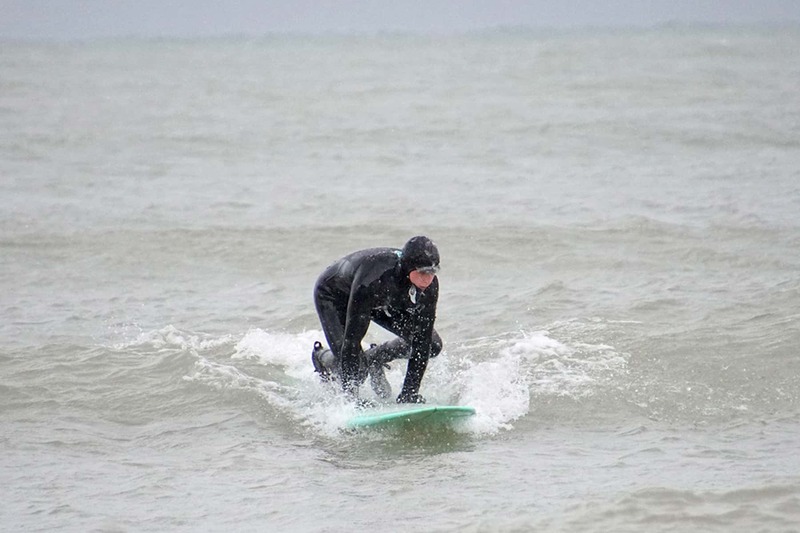 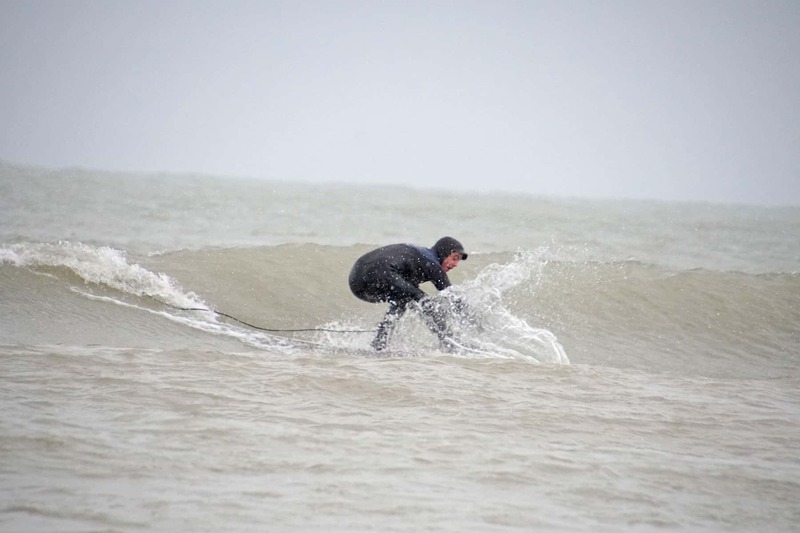 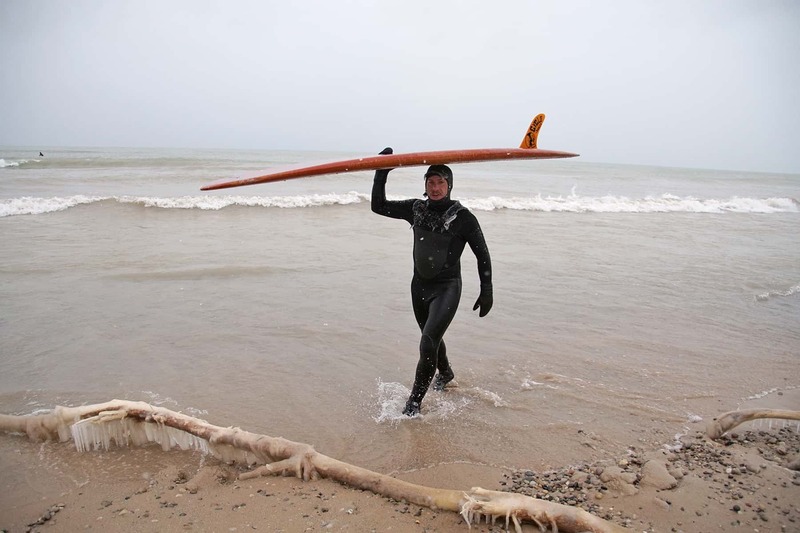 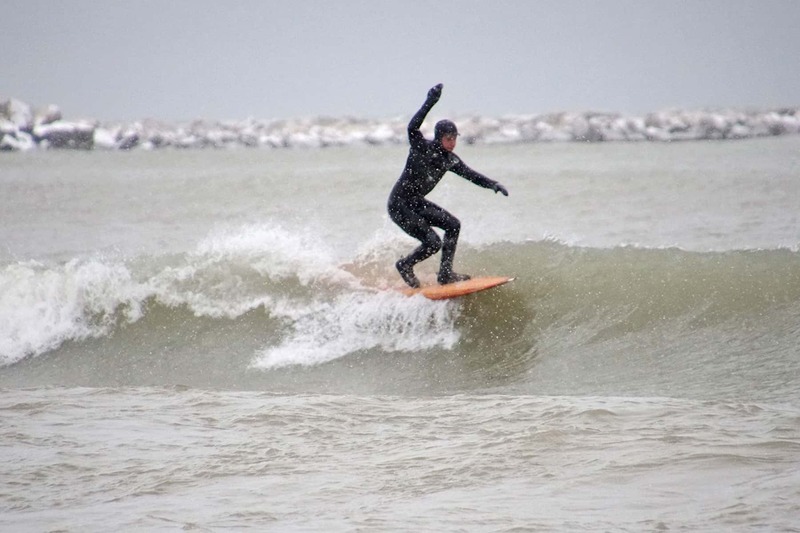 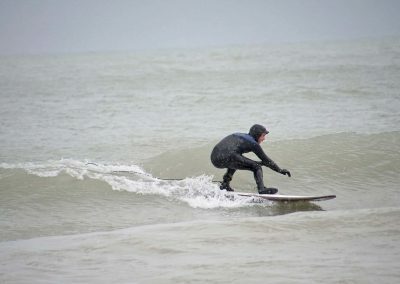 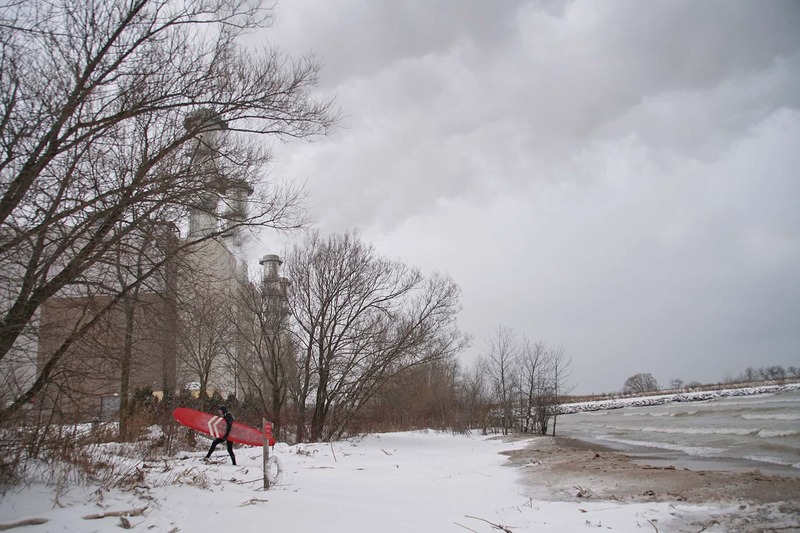 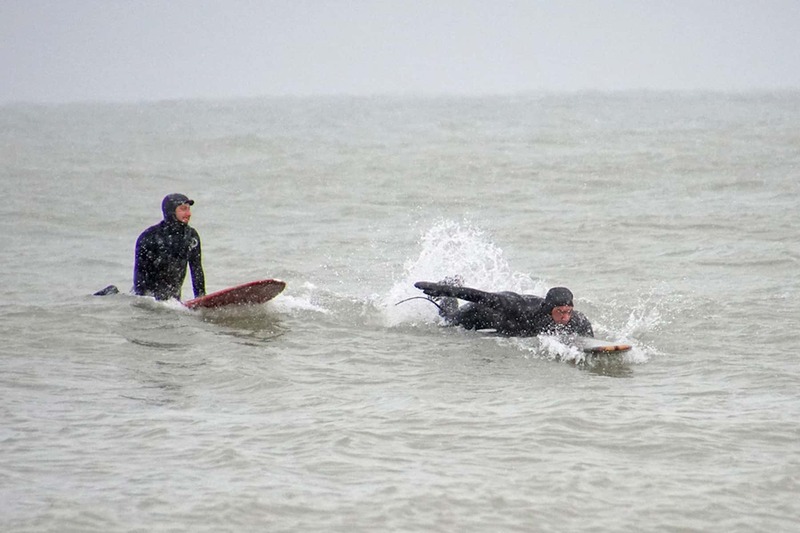 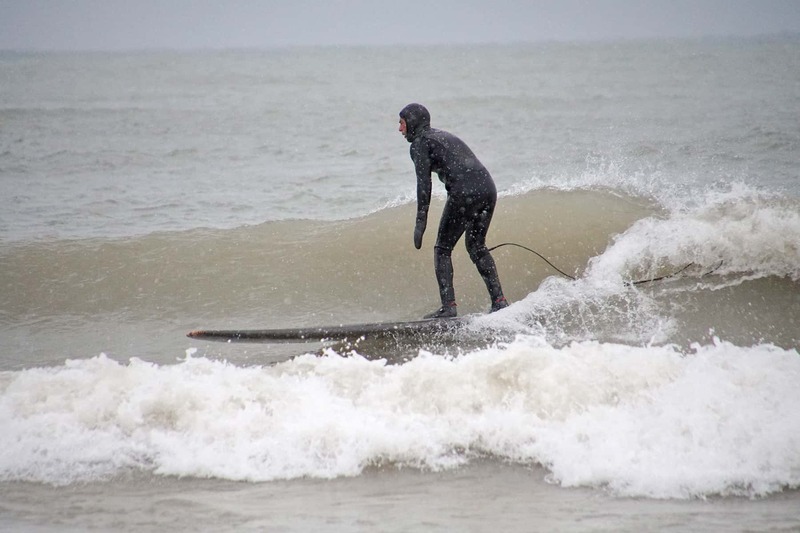 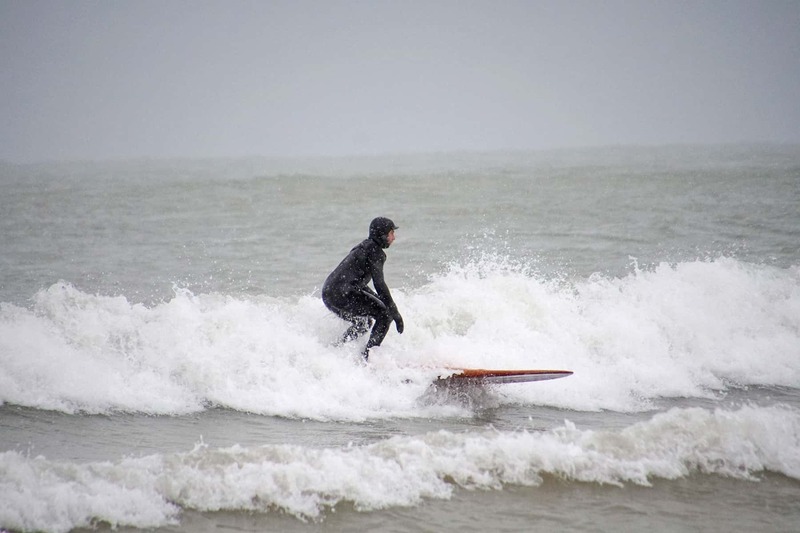 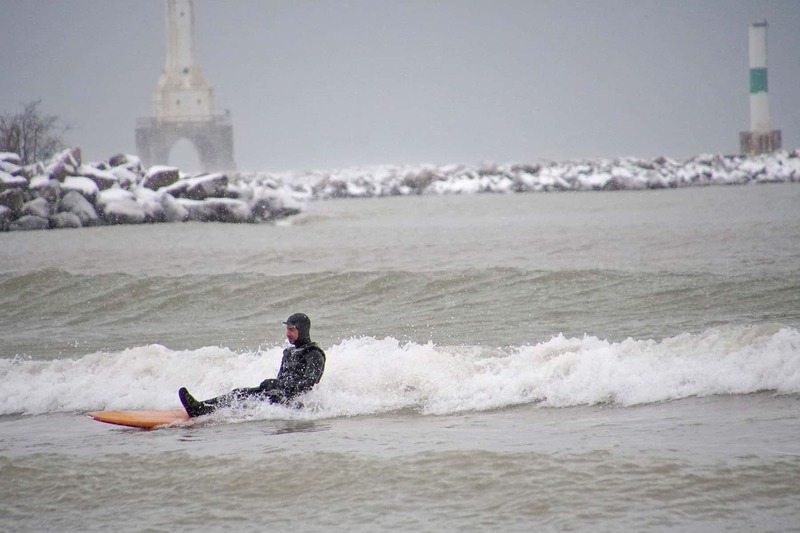 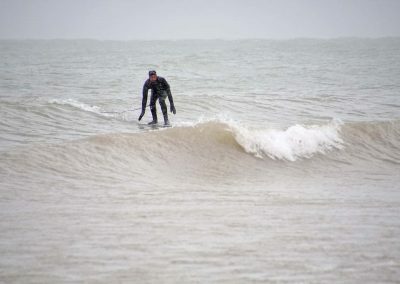 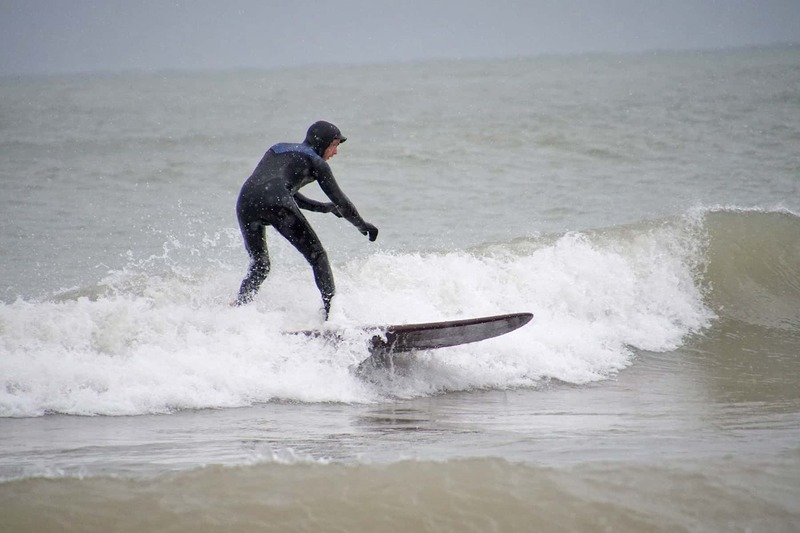 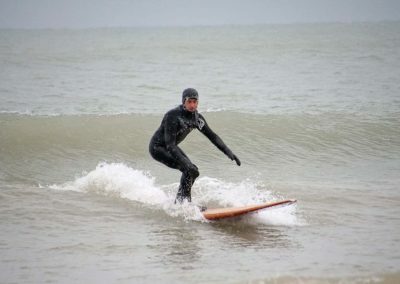 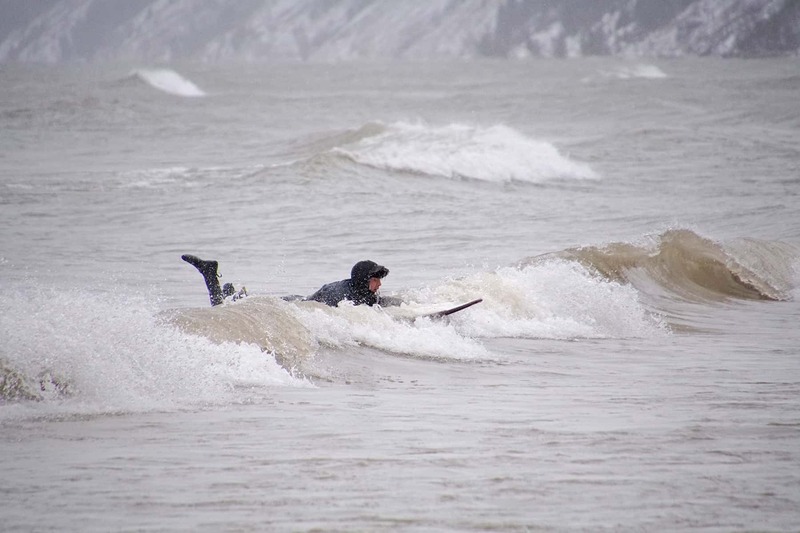 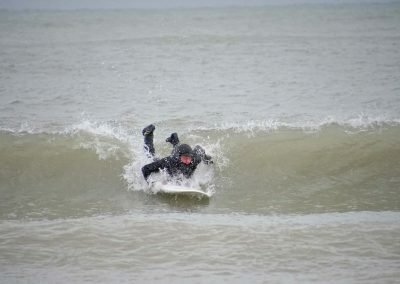 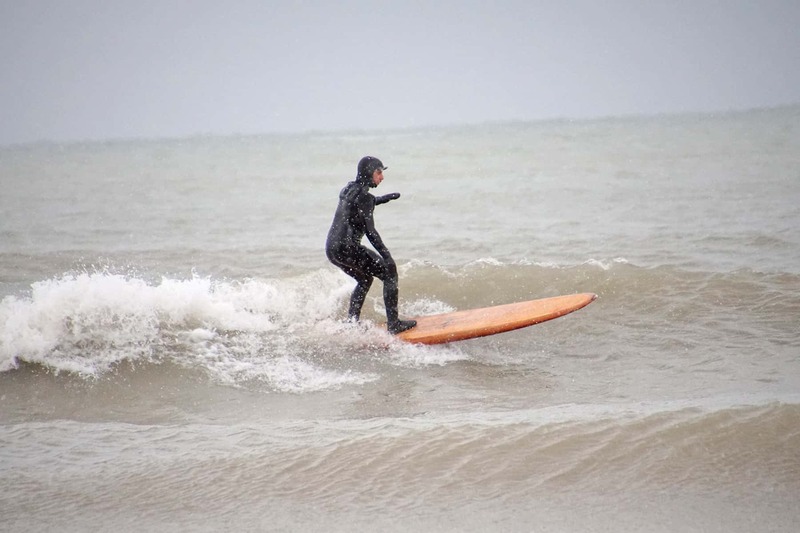 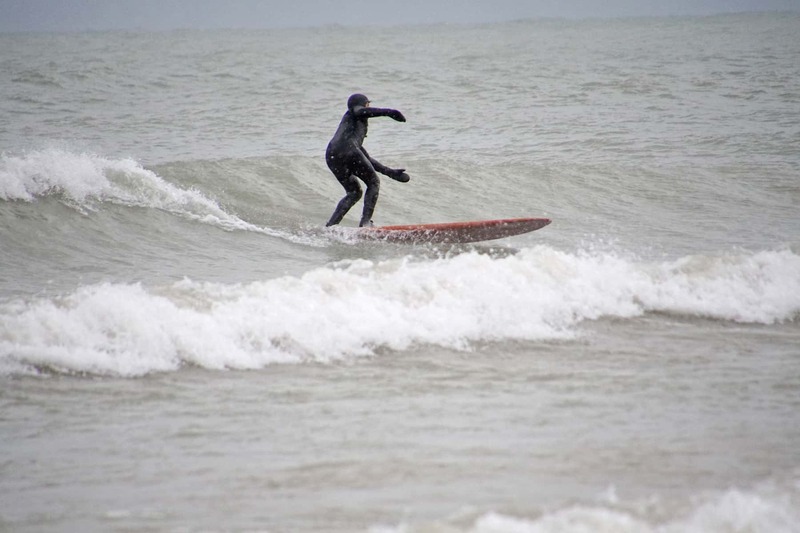 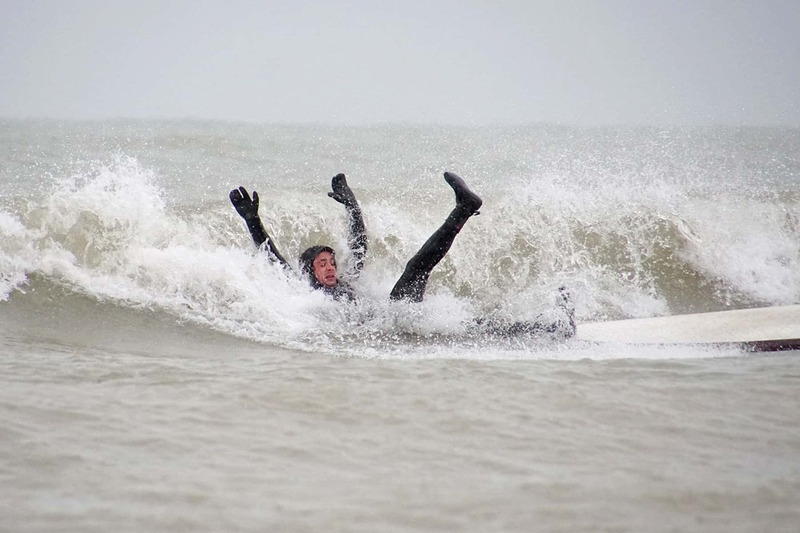 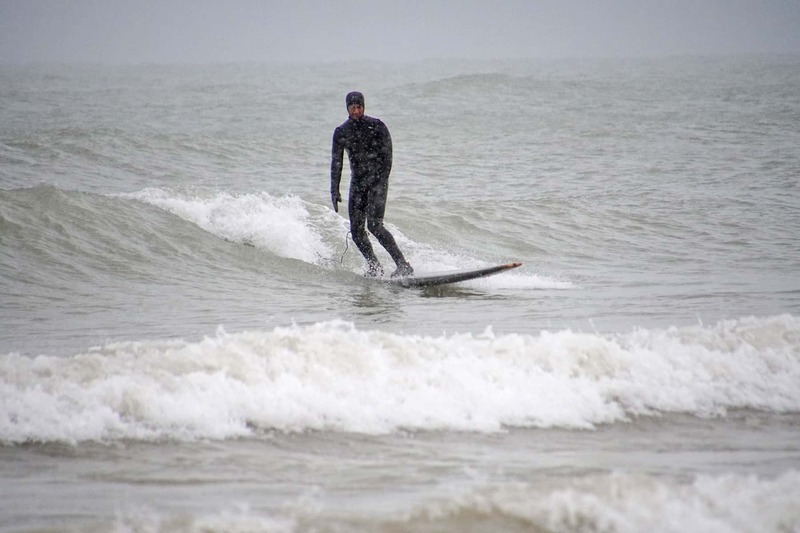 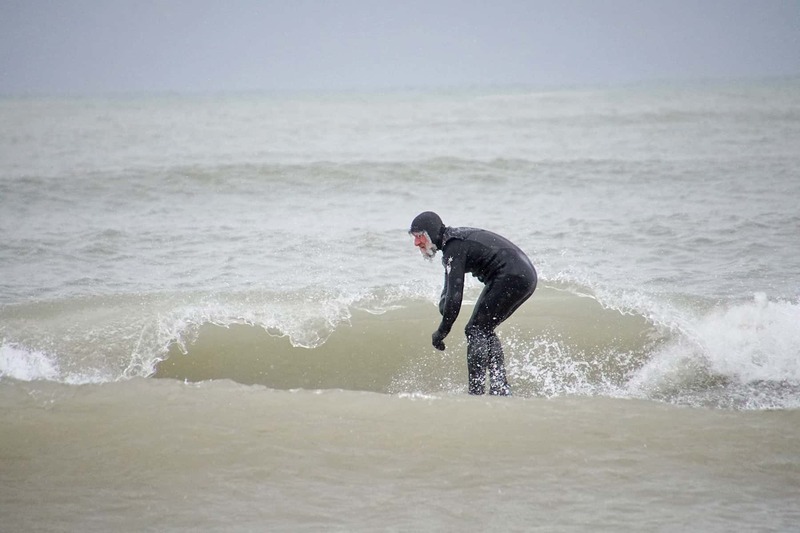 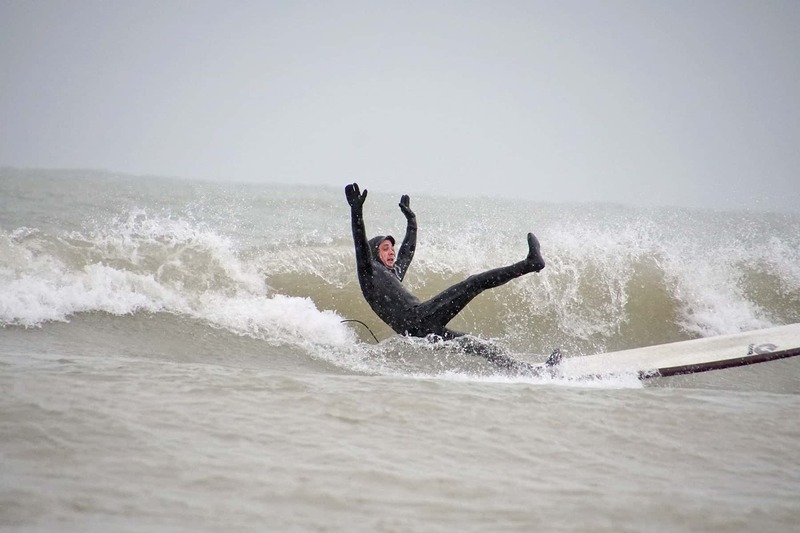 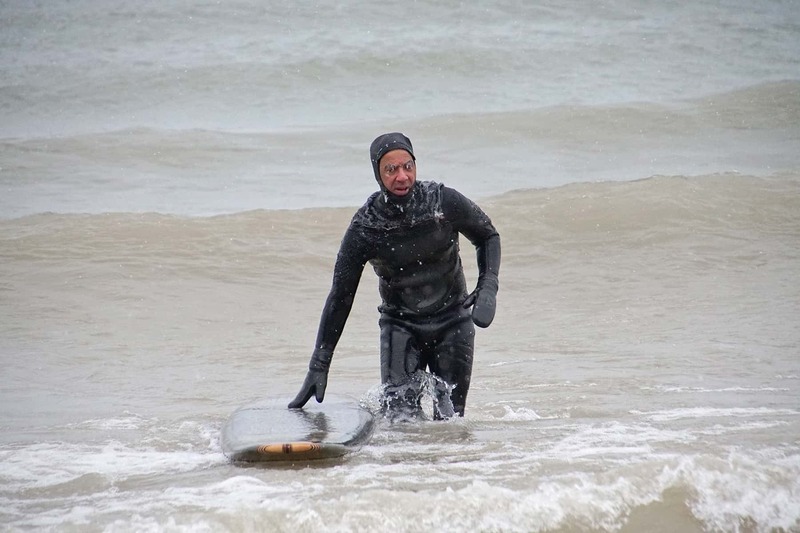 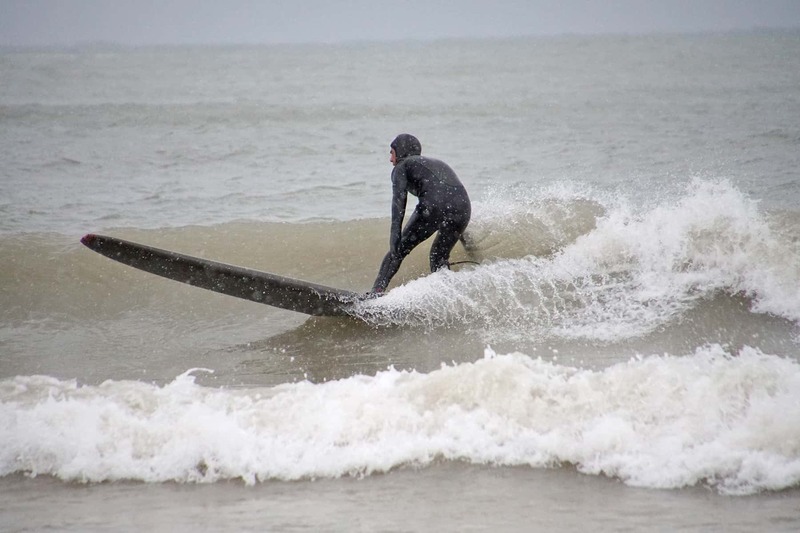 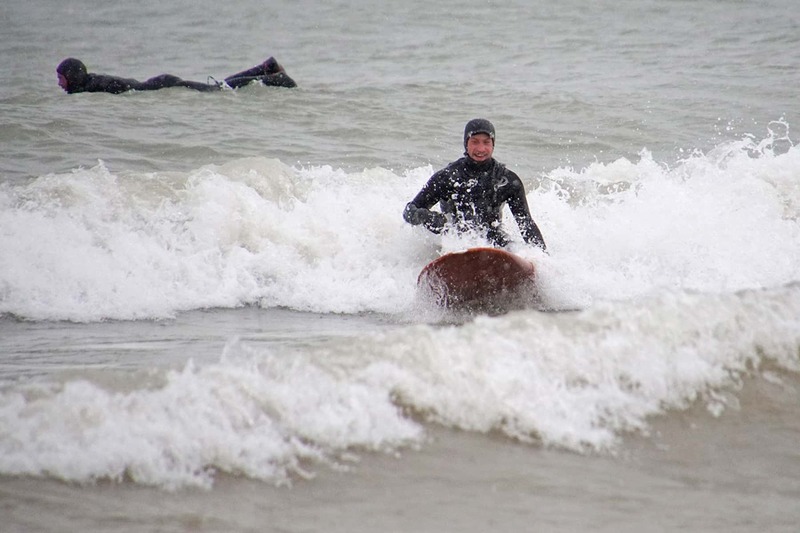 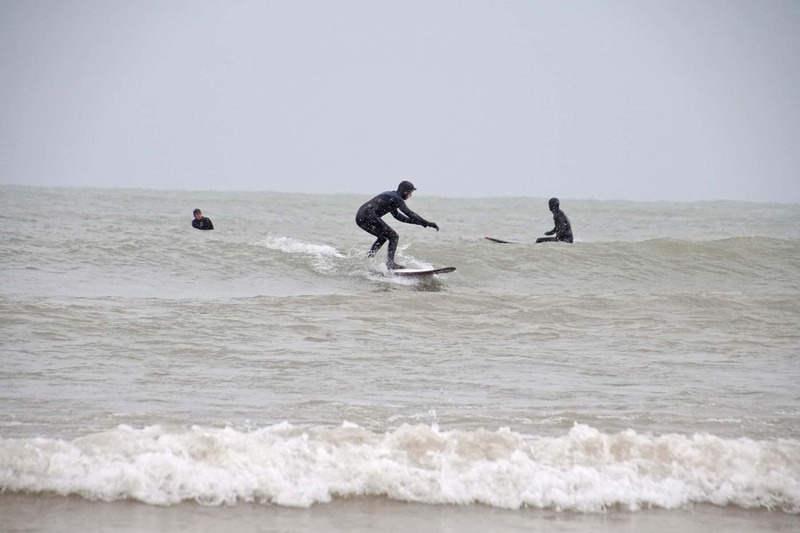 Despite the brevity and fleeting nature of each surf session, Lake Michigan provides the forum where these strong and enduring bonds flourish in ways often elusive on dry land. 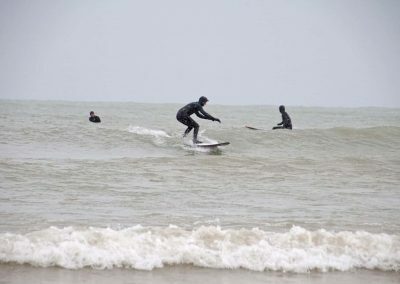 If allowed many embrace surfing as a means of psychological sanctuary, respite and peace amidst an aquatic environment that is unforgiving, exposed, physically demanding and humbling. 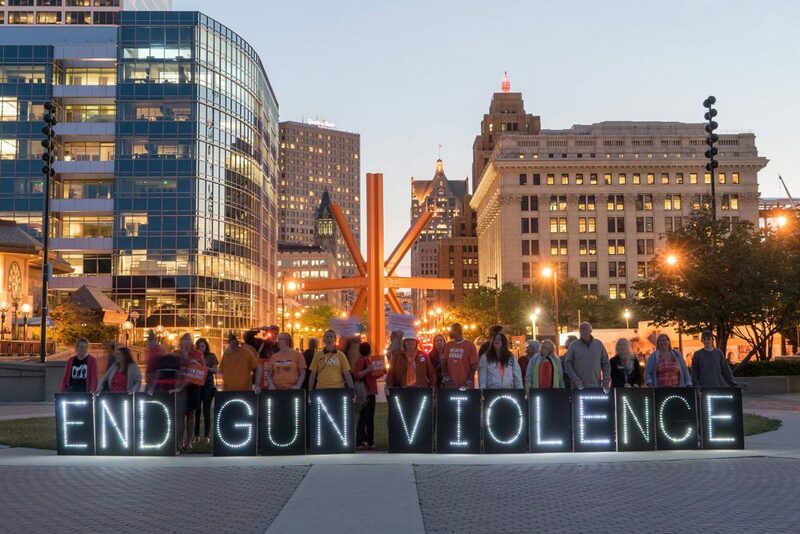 The contrasts could not be more clear, nor the benefits more profound. Yet regardless of individual motives, in the water, a connection remains, as does a shared compassion and concern for one another often not manifest in the workplace, on a golf course or around the poker table. 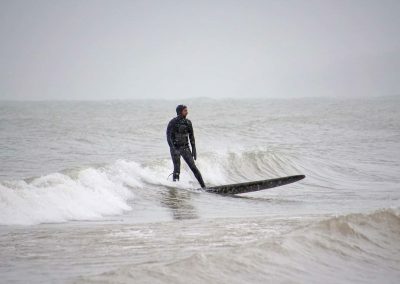 This is a connection available to all, one of dialogue, a celebratory hoot, or those respective moments of solitude, backs to the shore and eyes on the horizon. 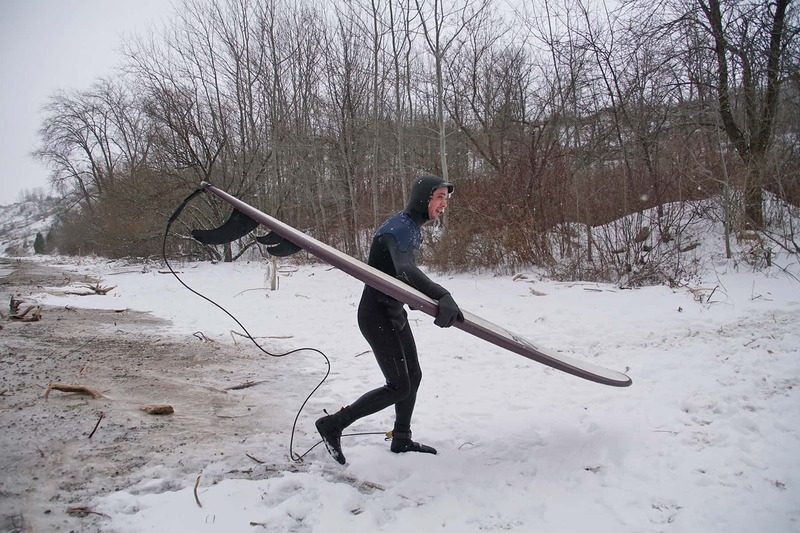 While their paths rarely cross on dry land, in the water these relationships are refreshed. 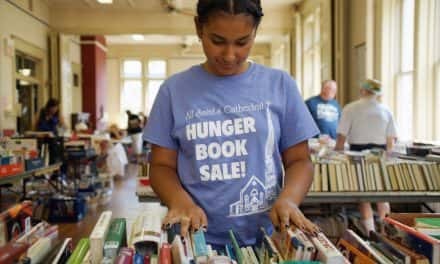 Educators, artists, health care workers, students, programmers and those between jobs remain a diverse group with a common connection. 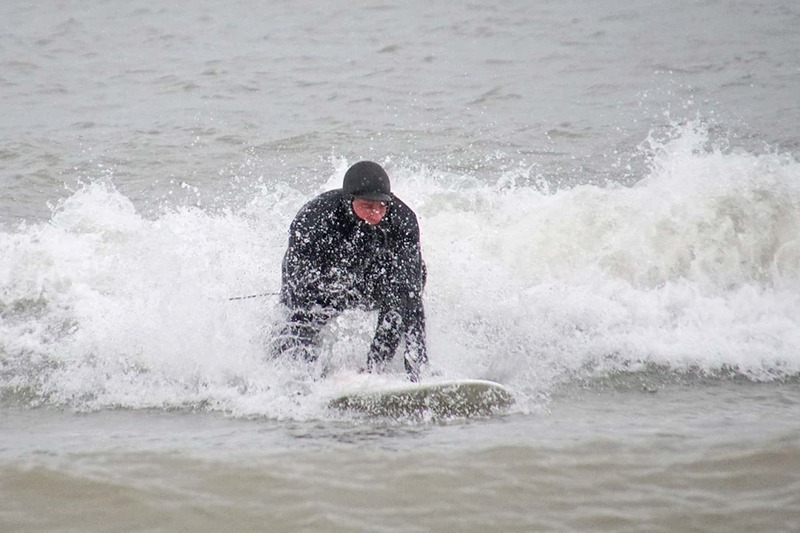 This commonality is currently foreign to those who watch from shore, through a camera lens or on their screen. 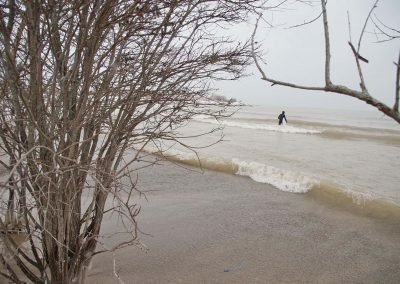 But should they allow and embrace their connection to the water and to nature itself, they too can come to understand that what once appeared “crazy” is actually an undeniable moment of sanity in an otherwise chaotic world. 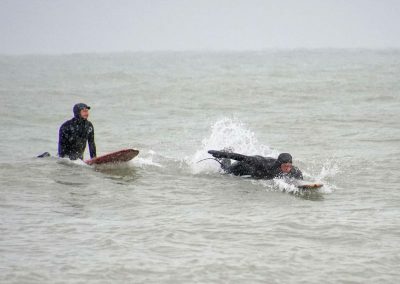 With that, one realizes that there is nothing unique or strange about going to great lengths to do what you love, what makes you feel alive. 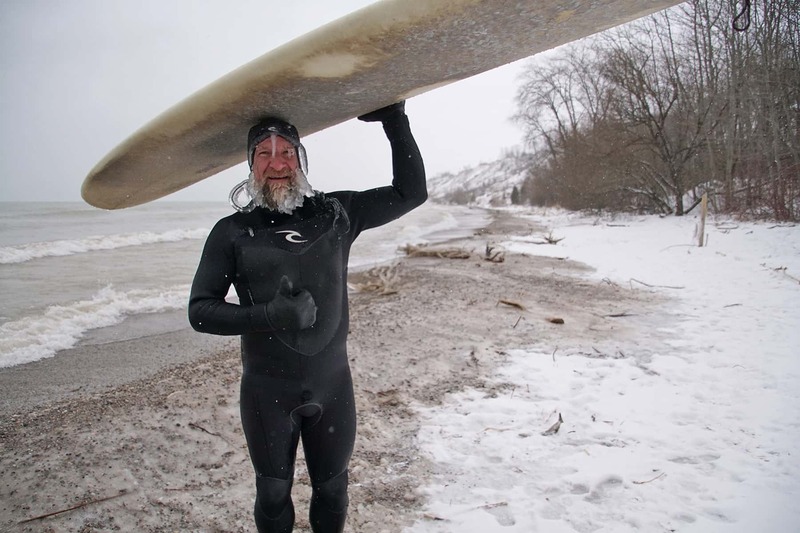 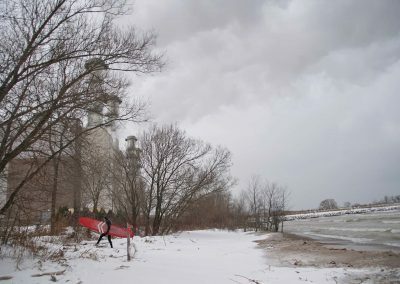 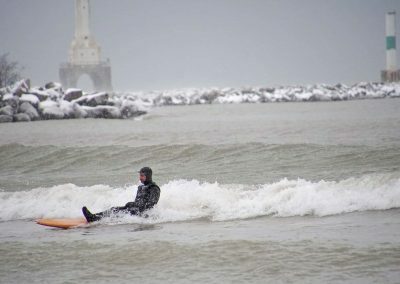 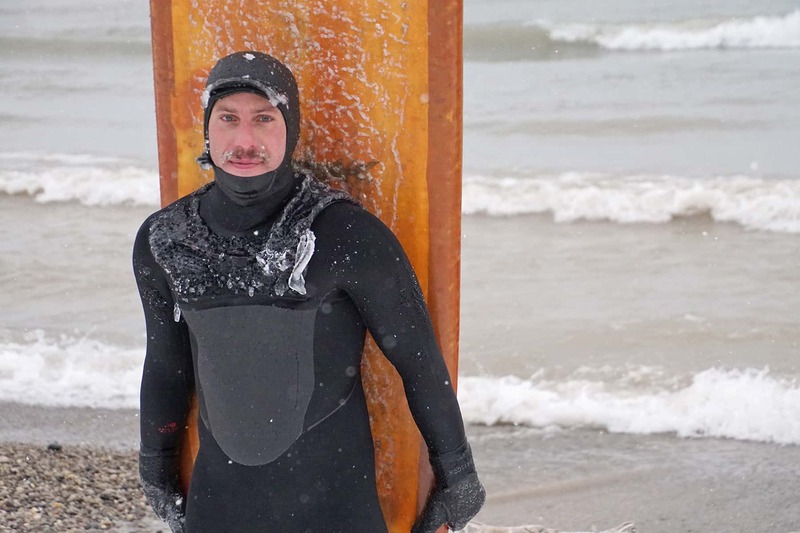 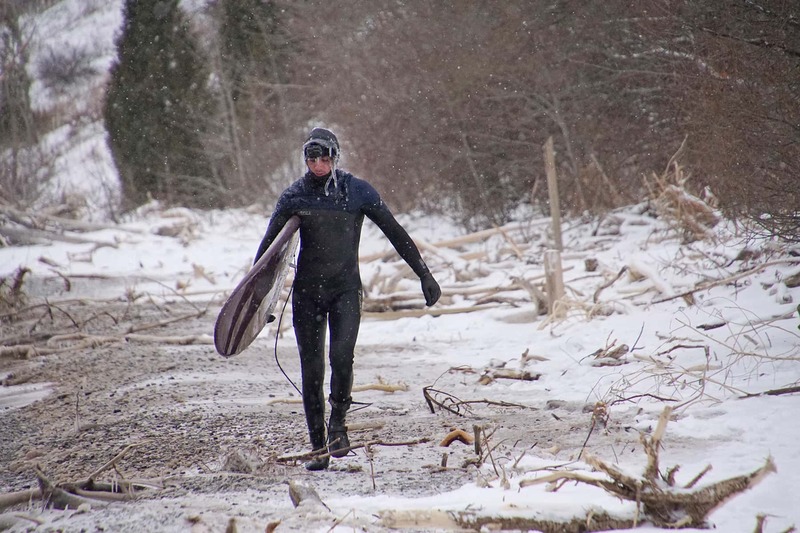 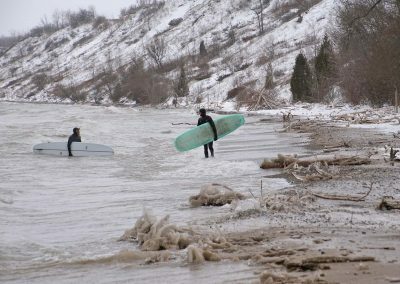 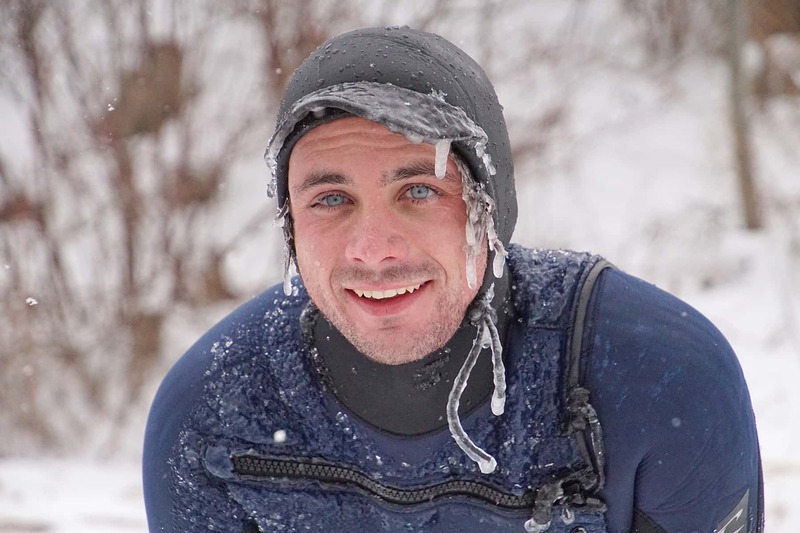 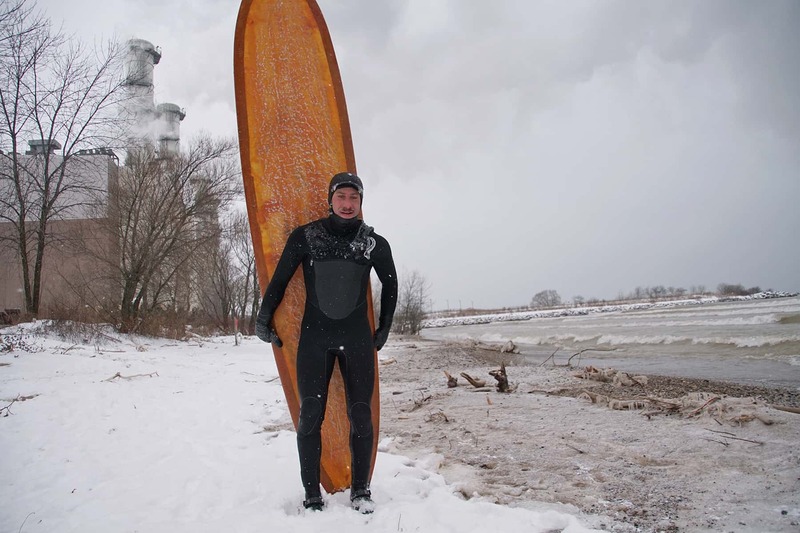 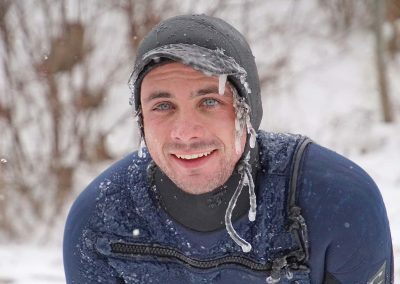 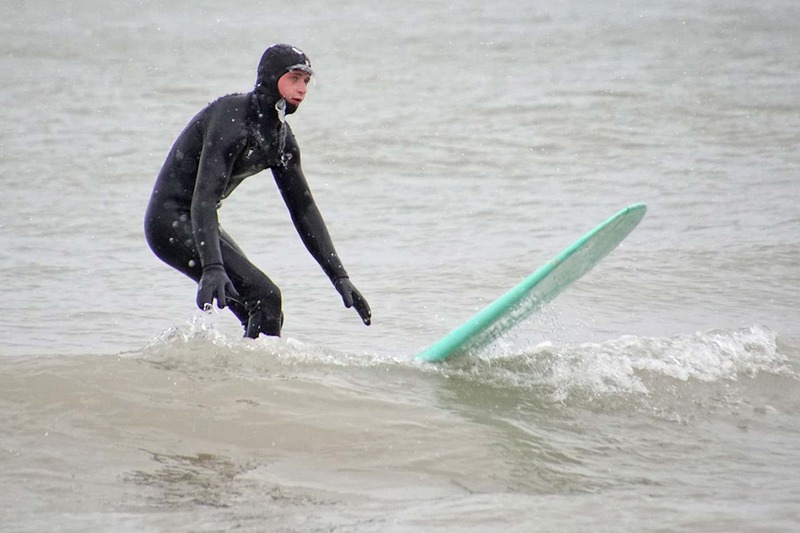 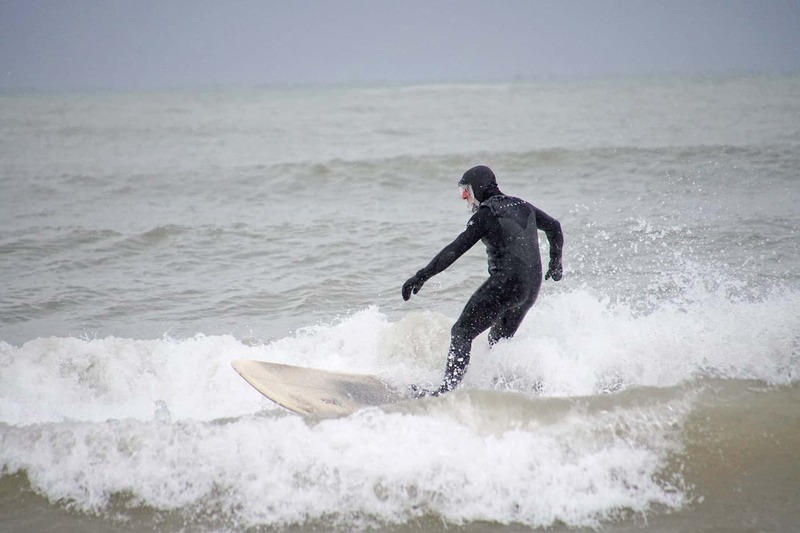 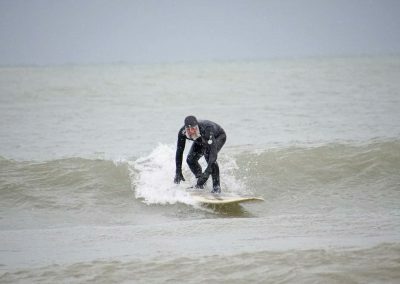 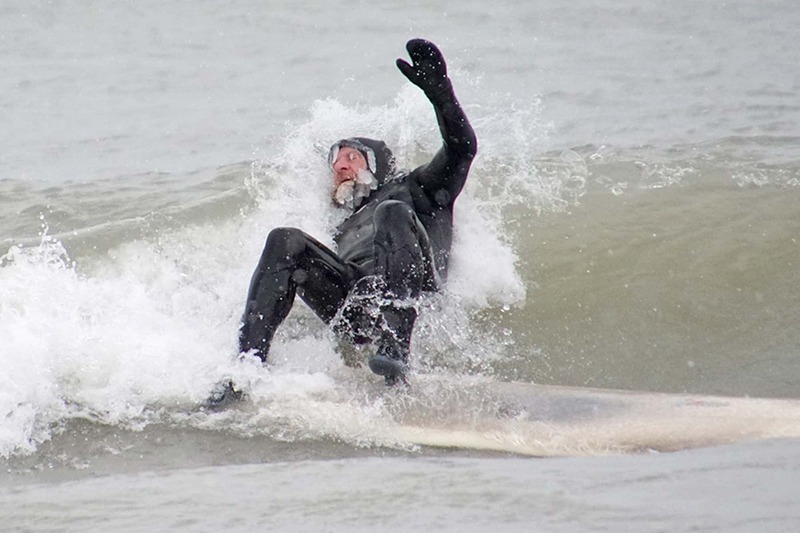 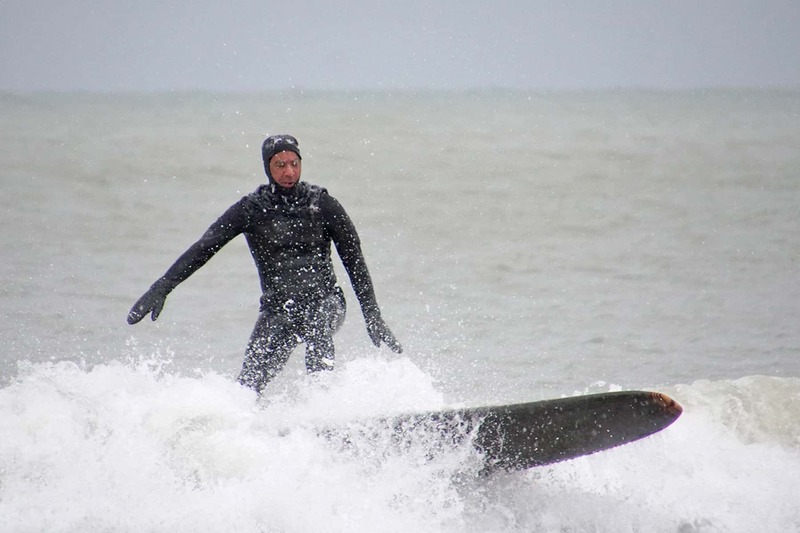 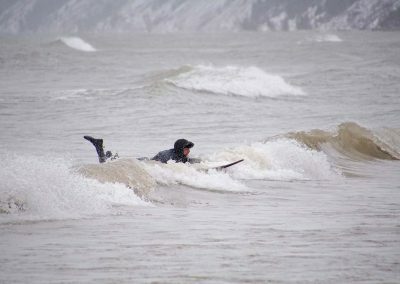 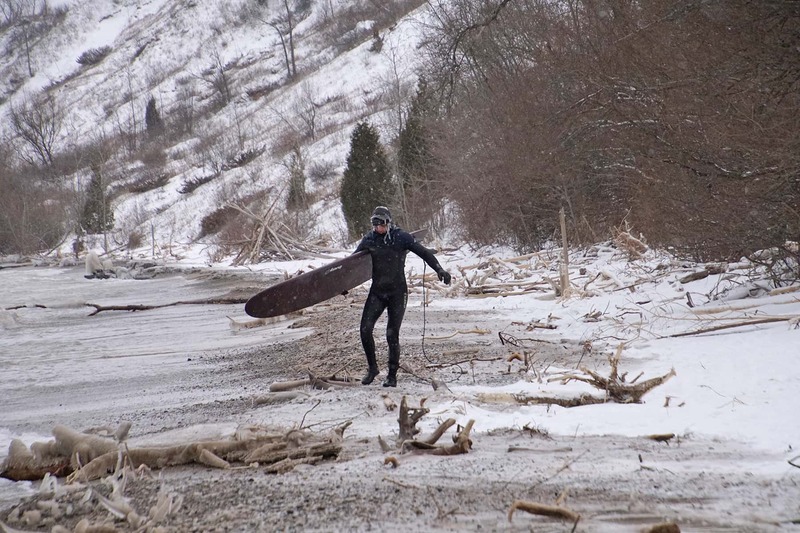 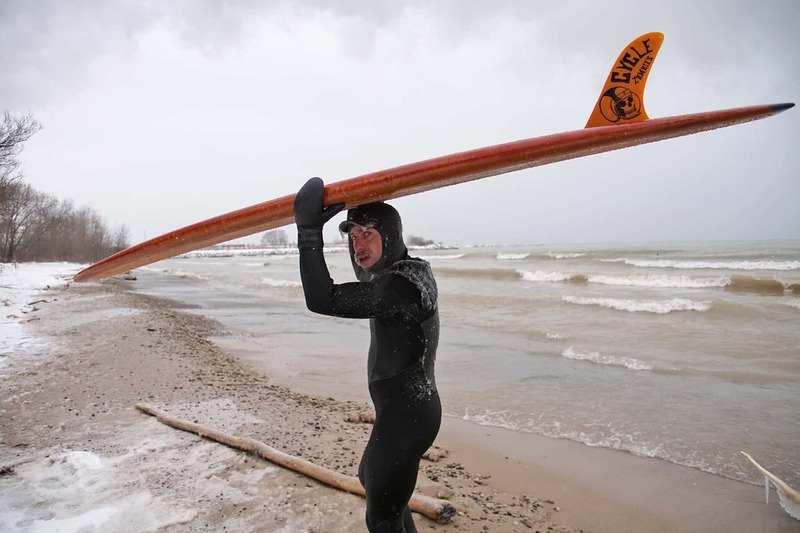 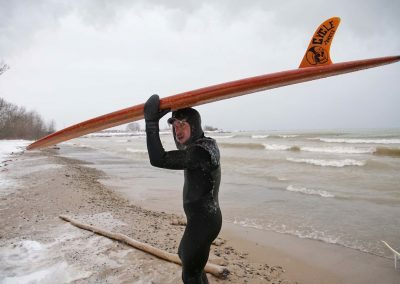 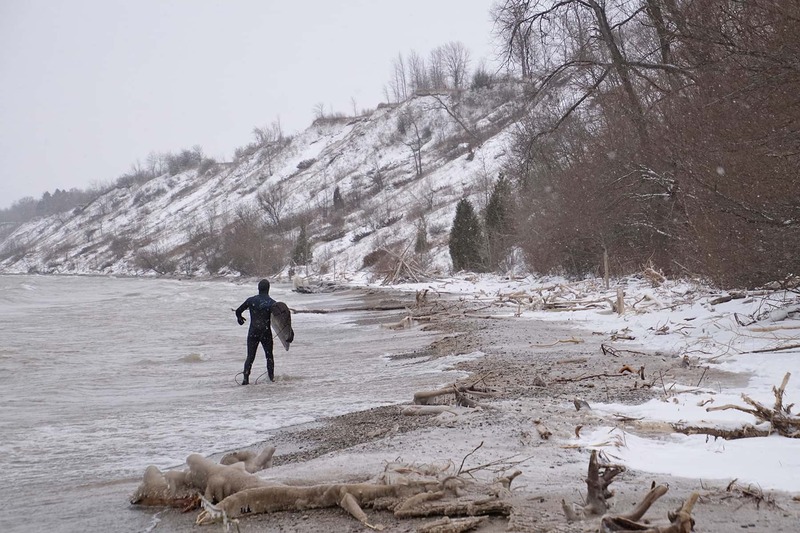 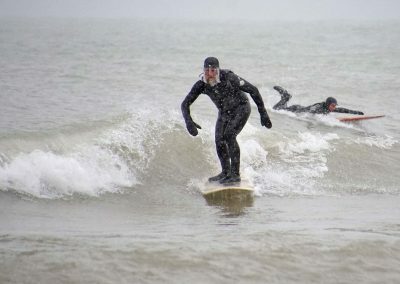 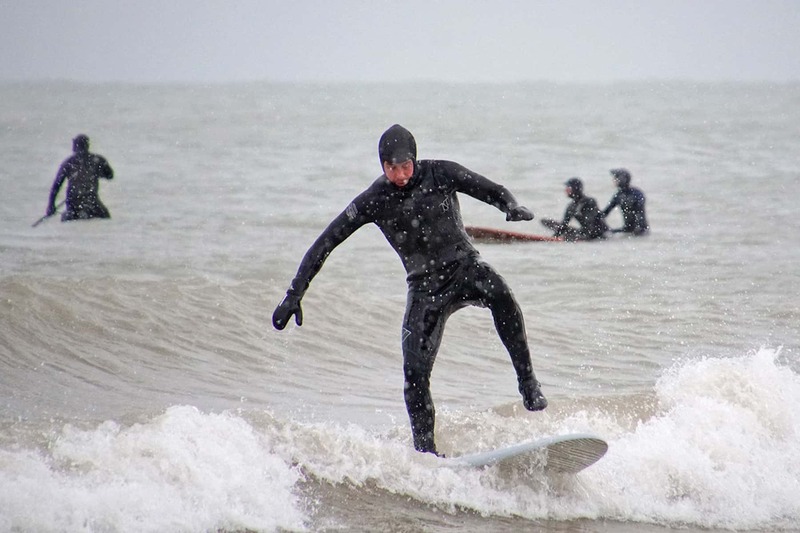 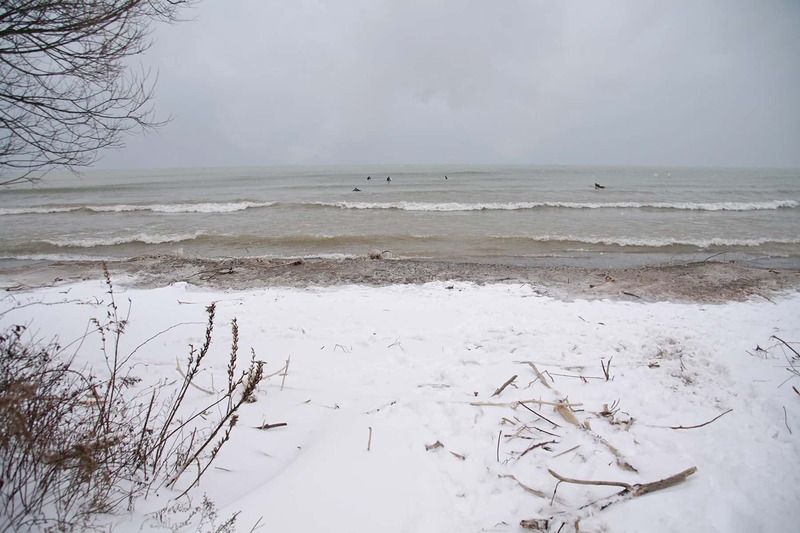 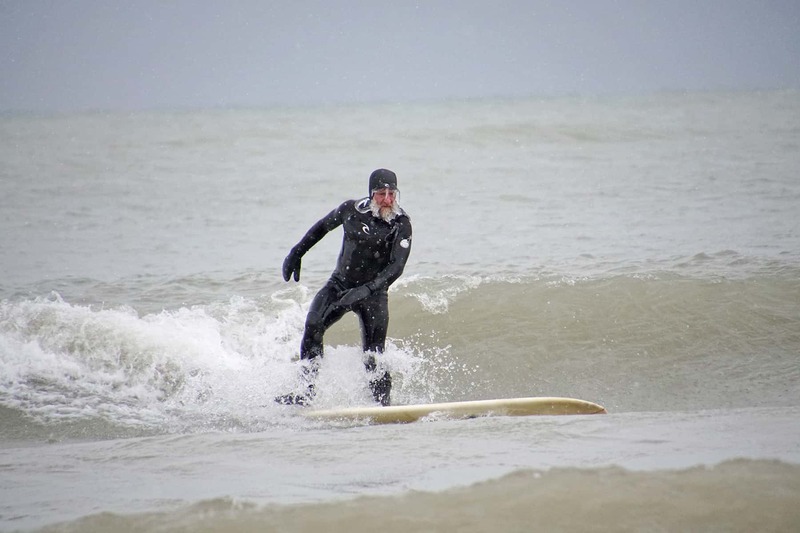 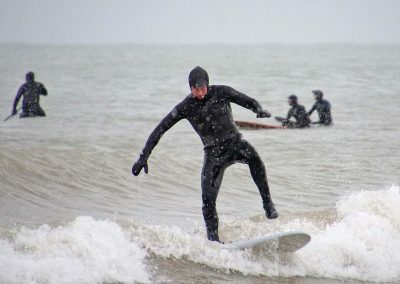 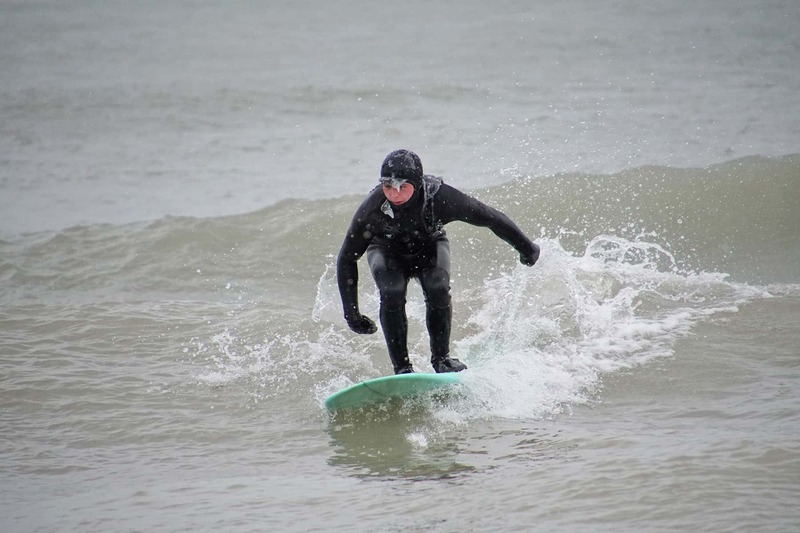 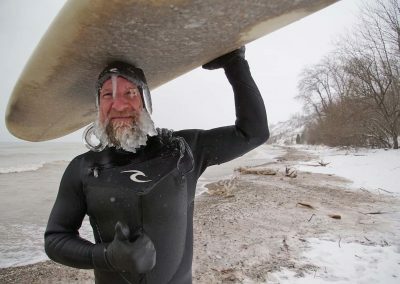 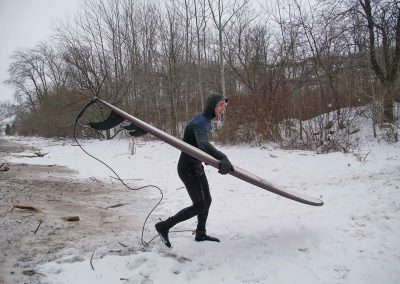 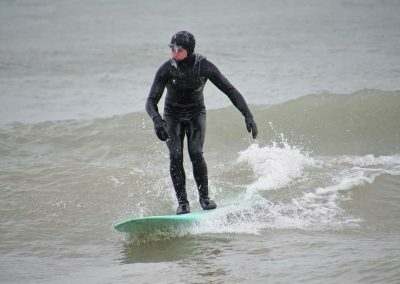 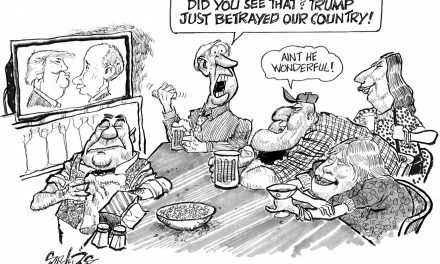 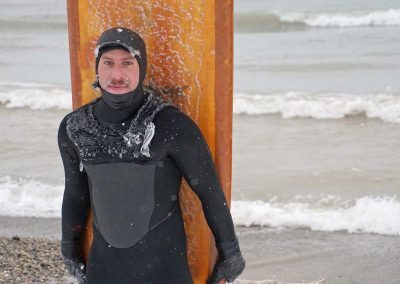 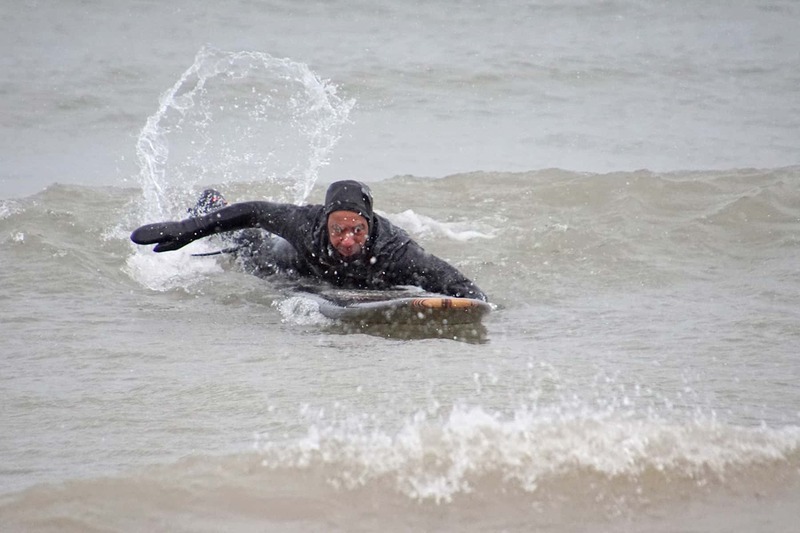 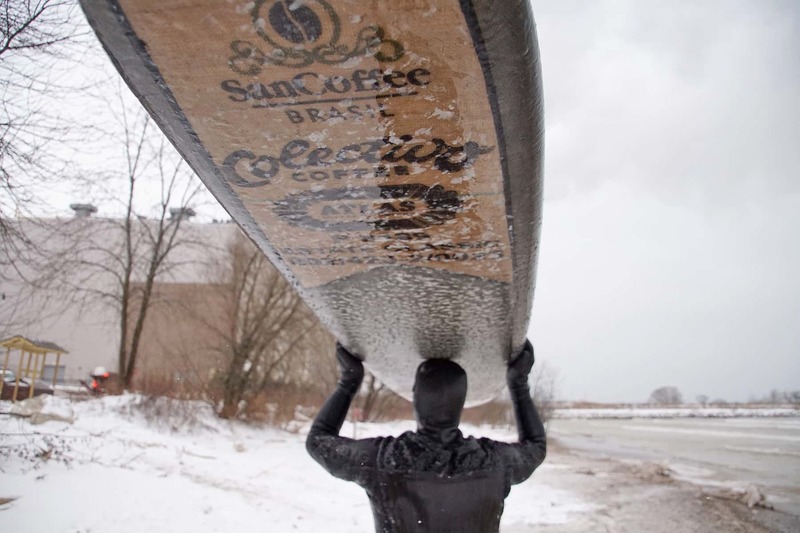 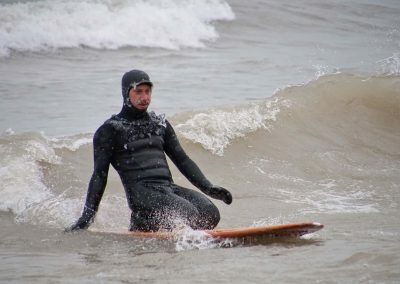 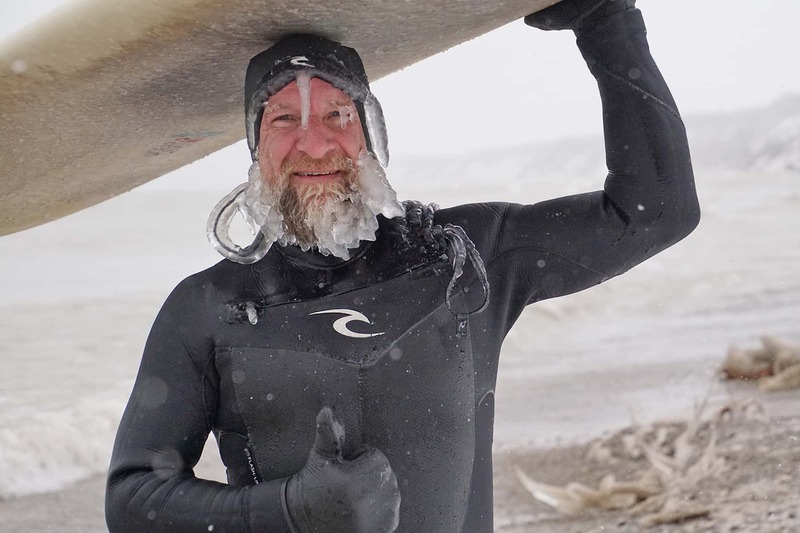 When seen through this lens, one that has little to do with ice beards, hang tens, or comments of shock or disbelief, surfing on the Great Lakes becomes normal, if not second nature. Most of all, something that once seemed elusive to so many is now suddenly within your reach as you discard the self-imposed or externally driven restrictions of what you can or cannot do. 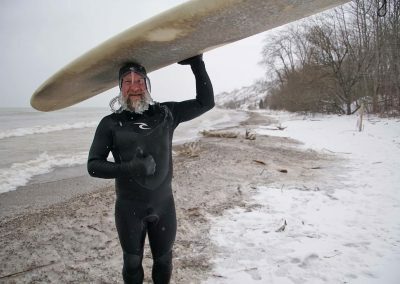 As the years pass more and more people are discovering our Great Lake Michigan in more enriching and immersive ways. 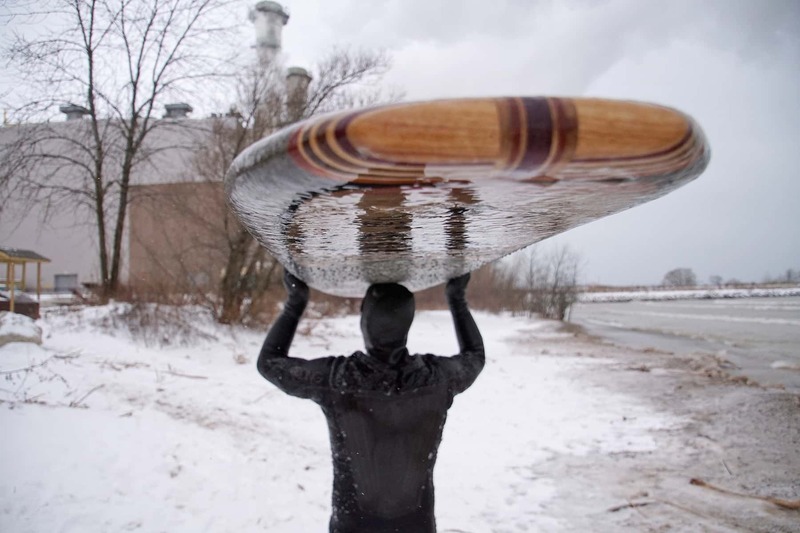 Not viewing it from a distance as if it’s just a picture on a wall, but as something they can jump into, celebrate, and collaborate with to become whole. 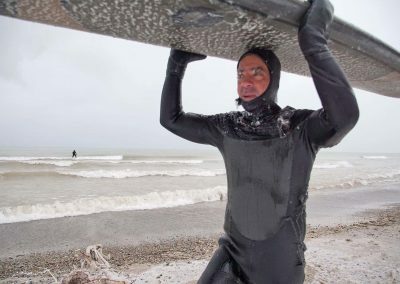 Whether it’s walking into the water before the sun has broken the horizon, or pouring hot water over the ice that has encrusted the zipper on your wetsuit, these actions are part of a necessary sequence that unfolds as a ritual of appreciation of our Great Lakes. 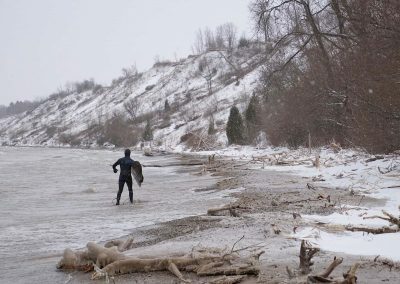 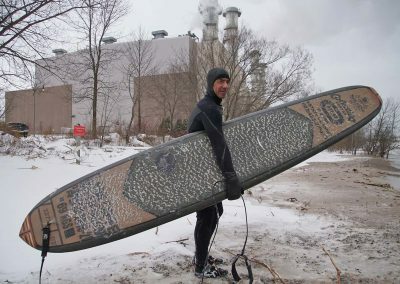 Across Milwaukee, people are returning home to these waters and they leave refreshed and changed realizing that there is nothing unique about doing what you love, or fighting to protect it. 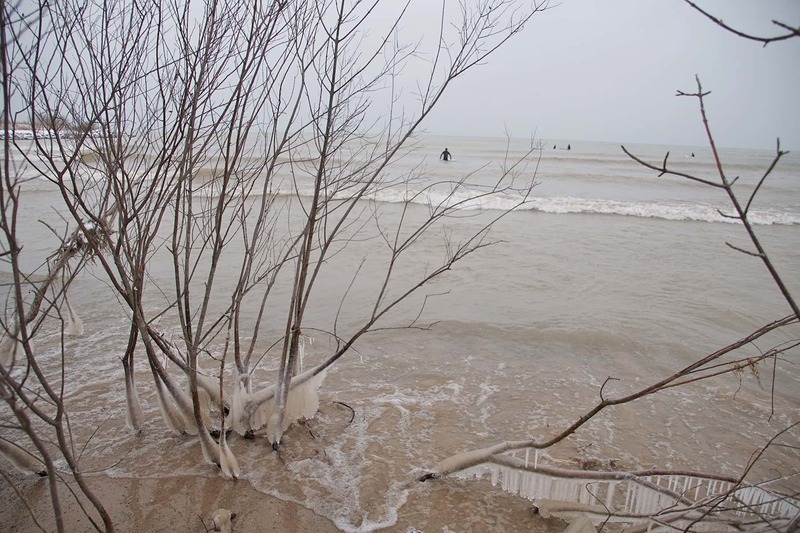 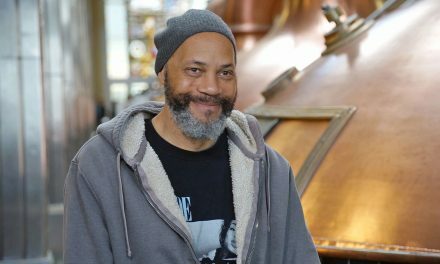 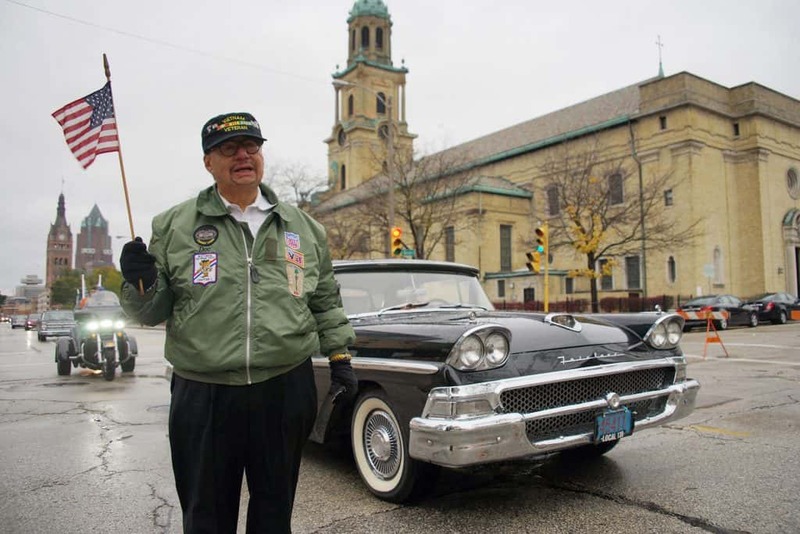 This return home to water by many in Milwaukee is not due to social media or serendipity, but may be an act of fate that was set in motion in 1902 with the birth of Thomas (Tom) Edward Blake. Born in Milwaukee, Blake is regarded around the world as one of the most influential surfers in history and is credited with transforming surfing into a sport and lifestyle now enjoyed by millions. 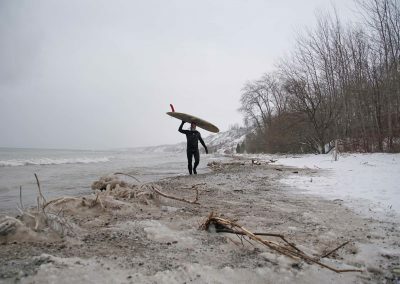 The influence, however, extends far beyond a wave ridden and embodies a relentless need and drive to protect the environment both in the water and out. His credo of “Nature = God” is less theology and more about the scope and importance of nature in our lives. 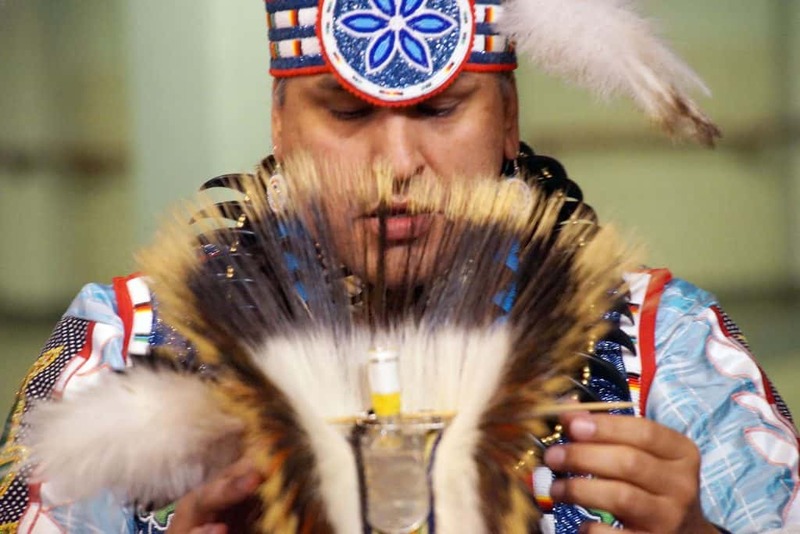 With the endless changes in our political and environmental climate, the need for steady understanding and protection of what we love is unrelenting. Each new person discovering the water in a new way leaves knowing the power it has to change the very life it sustains. 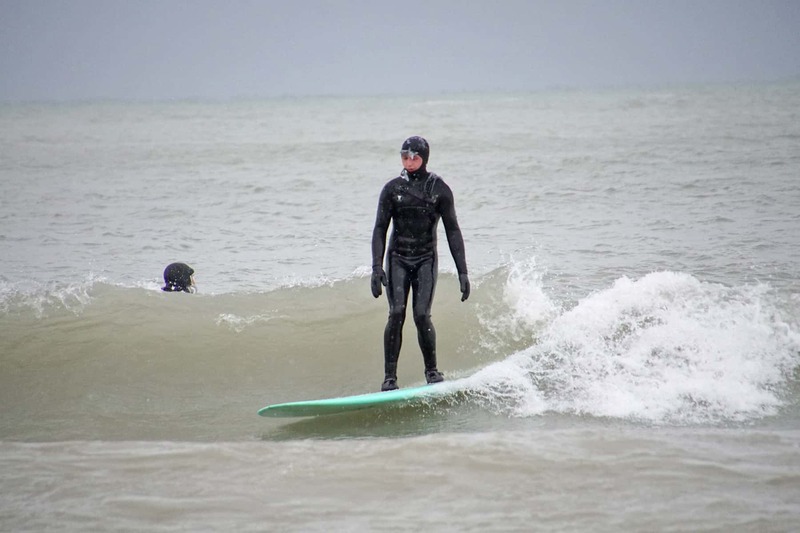 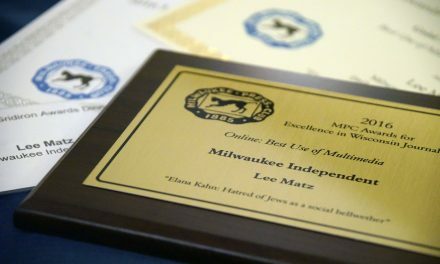 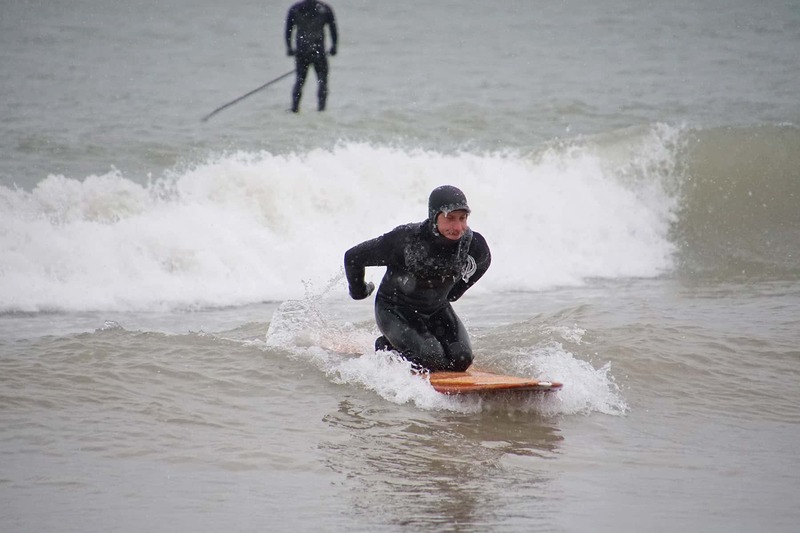 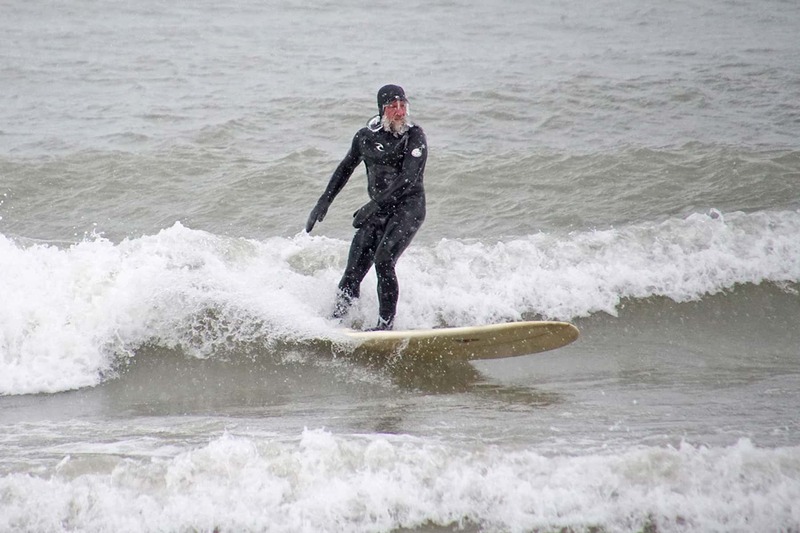 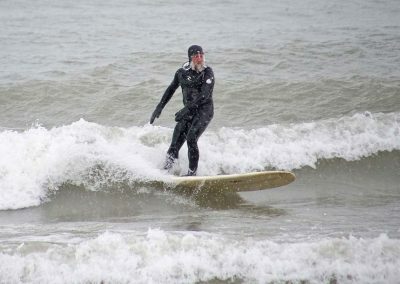 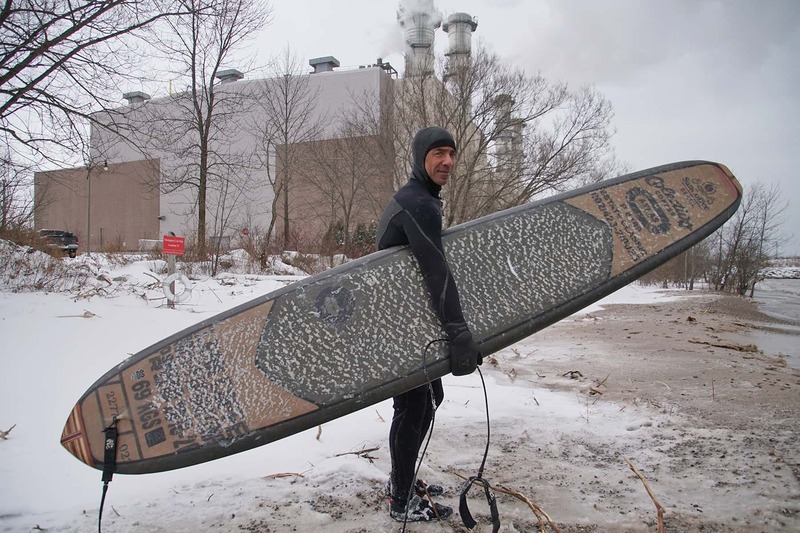 And as surfing returns home to Milwaukee the excitement people feel when they see people surfing has less to do with disbelief and is more about their own anticipation and excitement for the time that they will join us in celebration and acceptance. 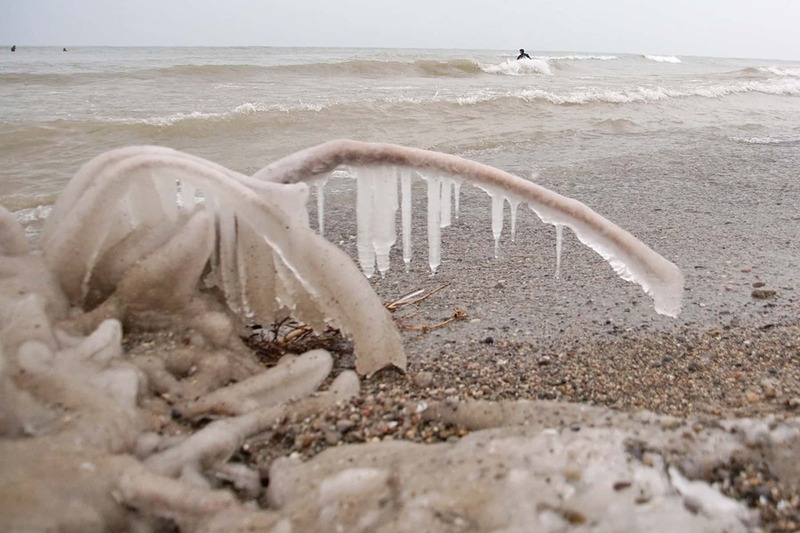 The thaw will come and the water will announce that it is there, waiting for you. 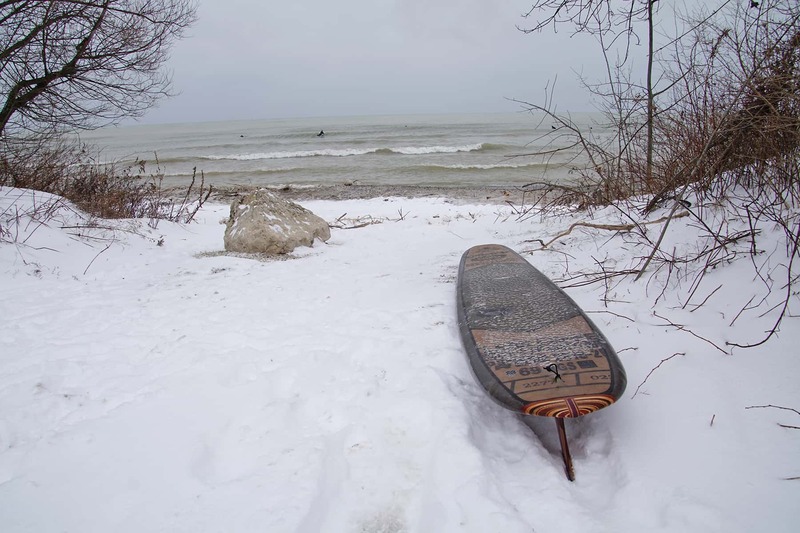 Listen for the drumbeat of the lake in ways you never have before. 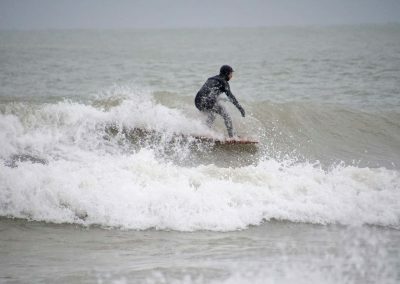 And if you allow it the waves will tell you what deep down you’ve always known. “While on a surfboard, either surfriding or paddling one is truly free from landbound restrictions. 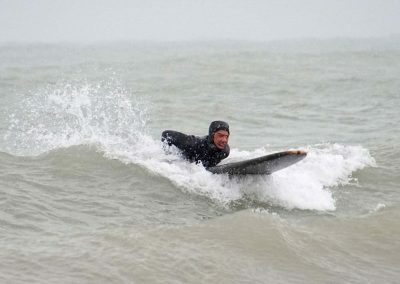 For that hour he is captain of his fate, of his miniature ship. 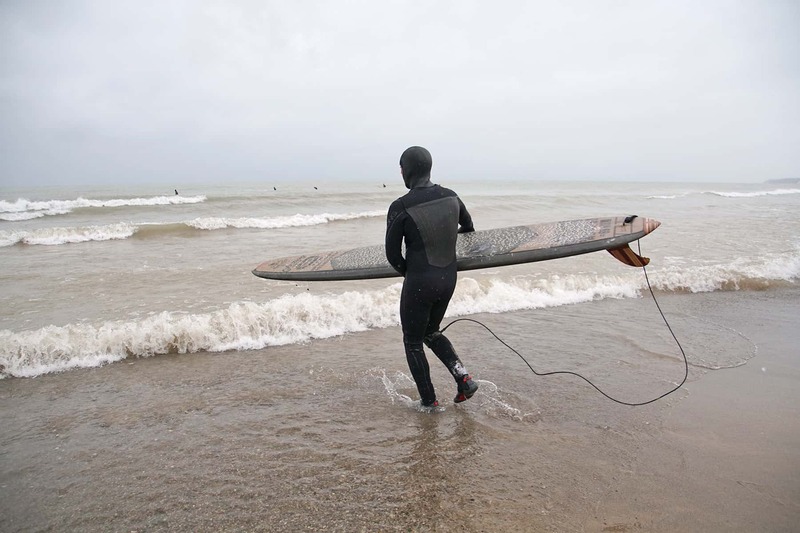 The burdens of city, school, job as well as the cares and worries of the subconscious mind are erased and forgotten until the tensions of living begin and build up. 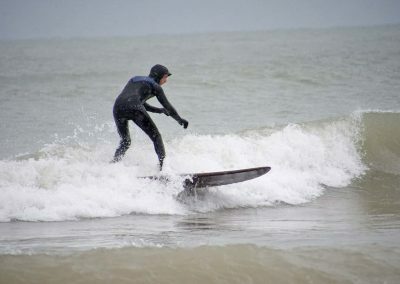 The remedy is obvious; go surfing. 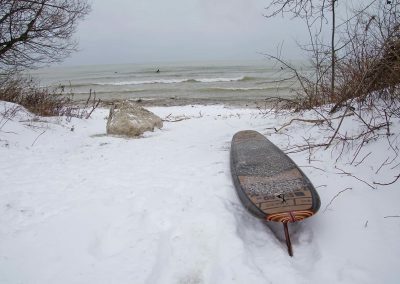 Next time you leave shore for some fun, look and listen for the muted voice of the atom, the voice of the wave, the voice of the good earth and you too will hear the drum beat. 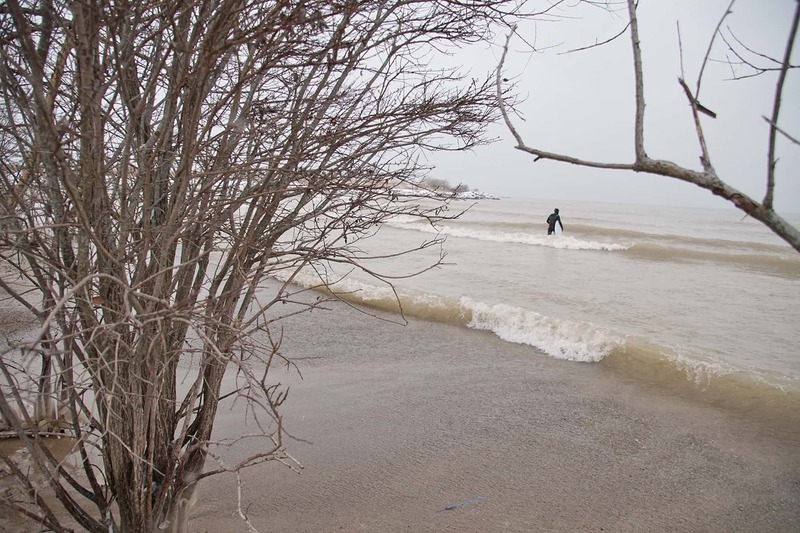 These photos were taken on the shores of Lake Michigan in the City of Port Washington, about a half hour drive north of Milwaukee, with an average air temperature of 20° during an ongoing snow storm. 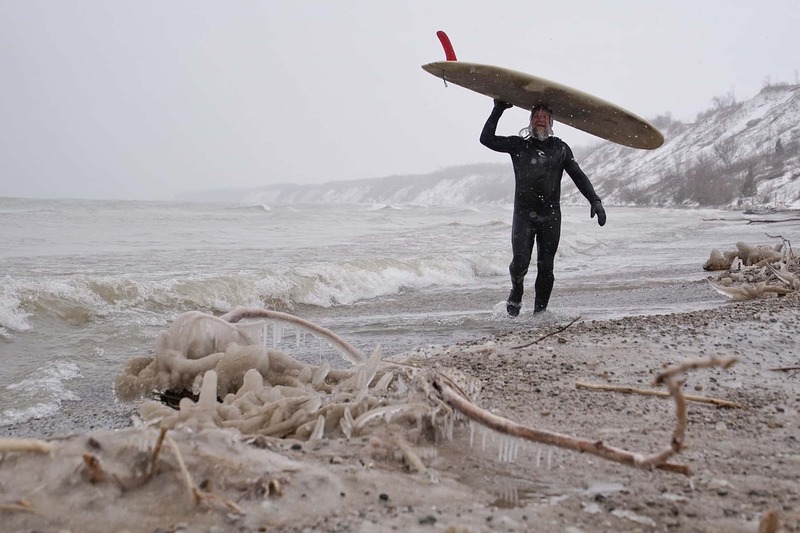 It was the very last day of the winter surfing season.